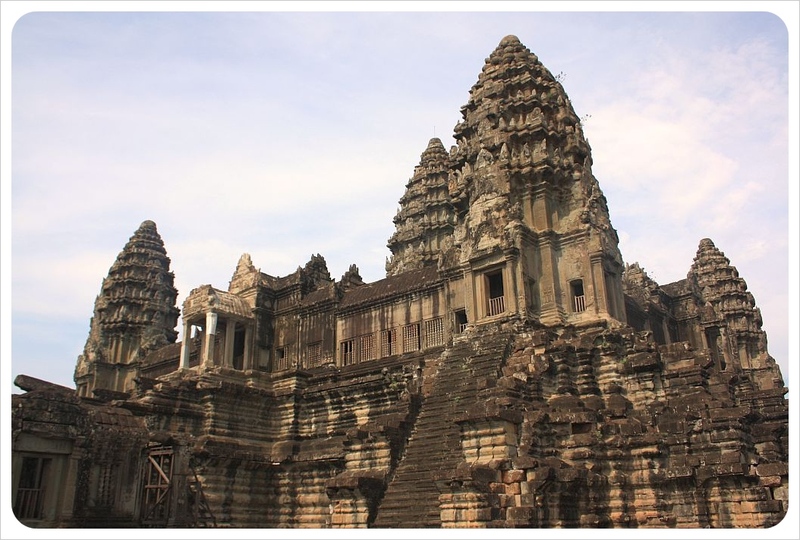 The ancient temples of Angkor Wat were at the top of Dani’s ‘Must-See in South East Asia’ list, but for me, the only connection I really had with the temples were their role in Lara Croft: Tomb Raider. But seeing how Angelina Jolie had filmed there, I was just as excited as Dani was to witness this mystical UNESCO World Heritage Site for myself. Just 6km from Angkor Wat, the town of Siem Reap is the base you’ll use for the days you are in town exploring what is the largest religious site in the world. Siem Reap is cute enough, and has plenty to do, but unlike other foreigner-friendly town, visitors are exclusively here to see the incredible temples scattered across a 400 square kilometer archaeological park. Although many tourists only visit the main temple complex, which is called Angkor Wat, we quickly realized that there are actually so many more temples to see that it makes sense to forgo the one-day pass and consider either a three-day or seven-day pass. As for us, we traveled with our friends Shannon and her awesome niece Anna so between all the goofing around and roughly one million impromptu photo shoots, we knew we needed that three-day pass, though Dani could have easily spent seven days here easily. Well over one million international tourists visit Angkor Wat each year, which means that there are dozens of travel agencies and tour companies in Siem Reap ready to put together a package for you. Some tours, like the Angkor Adventure tour we talk about below, are best booked in advance before arriving in Siem Reap, as these professional, international tour companies book up quickly. However, there are also plenty of local tour agencies with guides and transportation that you can book when you get there. These agencies tend to charge tourists two, three even five times the price when they book from abroad as compared to the price you can bargain your way down to when standing in their office. 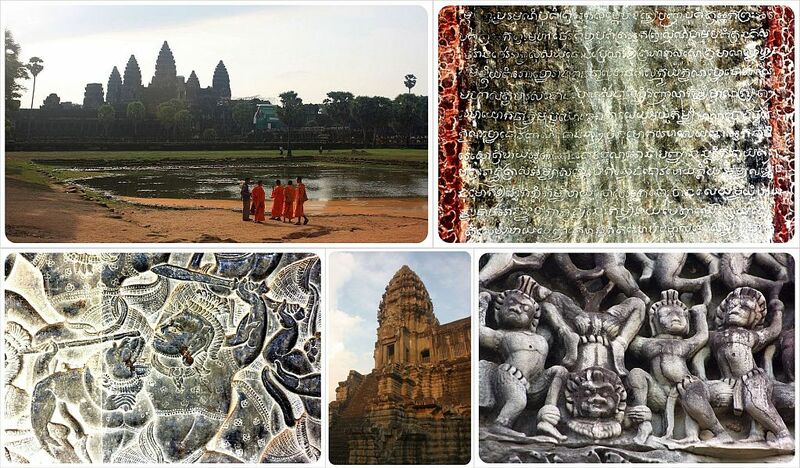 There are so many different ways to visit Angkor Wat, and we would recommend a healthy mix of the options below. Angkor Wat is truly awe-inspiring, and even a group of independent travelers like us knew that we needed an expert at least one day to teach us the main aspects of Khmer history and the temples. 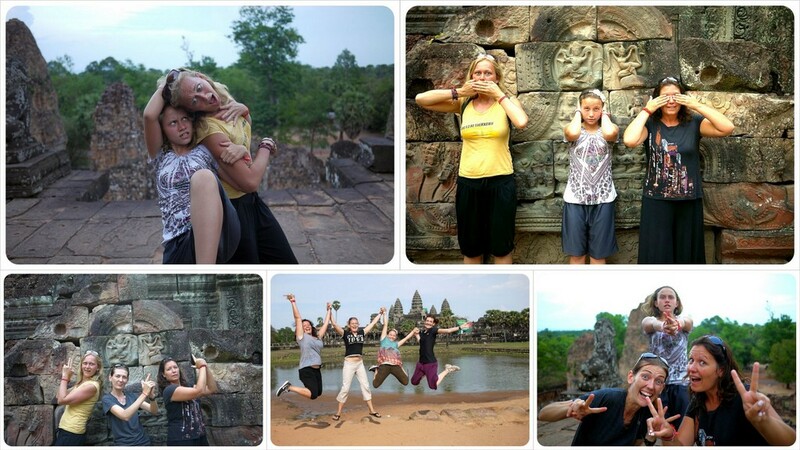 We joined Urban Adventures on their Angkor Adventure tour. The tour was one full day to the three main sites – Angkor Wat, Angkor Thom and Ta Phrom (the ‘Tomb Raider’ temple), plus an excellent lunch at a local restaurant and transport in an air-conditioned van. We learned that this is the largest religious site in the world, and throughout the centuries it has been converted from a Hindu temple site (the world’s largest) to a Buddhist at the behest of the leaders at the time. 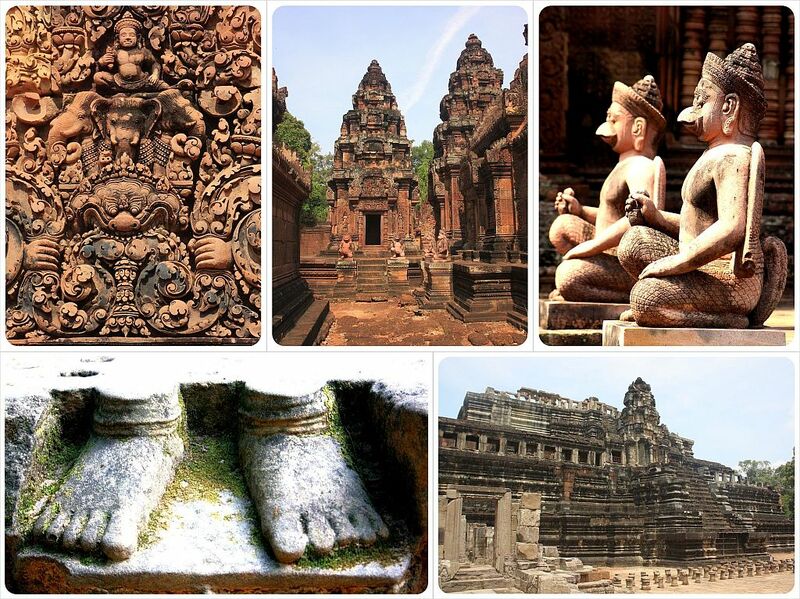 The over 100 temples, built between 802 and 1220 AD, are the remains of the magnificent Khmer kingdom which, at its peak, spread all across Vietnam and even into parts of China. As we explored the temples of the ancient town of Angkor Thom, we pictured how incredible it must have looked at its height, when over one million people would have populated this 10 sq km area. To put that into perspective, London was home to only 50,000 at that point in history. Many of the structures of this town, which was built by the greatest Angkorian king, Jayavarman VII, are Buddhist, not Hindu, as this was the leader who converted the Khmer from Hindu to Buddhist at the time. The most recognizable Buddhist structures are the temples of Bayon, which consist of 54 towers each featuring four giant stone faces peering out of the rock. This makes a total of 216 faces, all towering above you, observing you wisely as you traipse through this ancient kingdom. 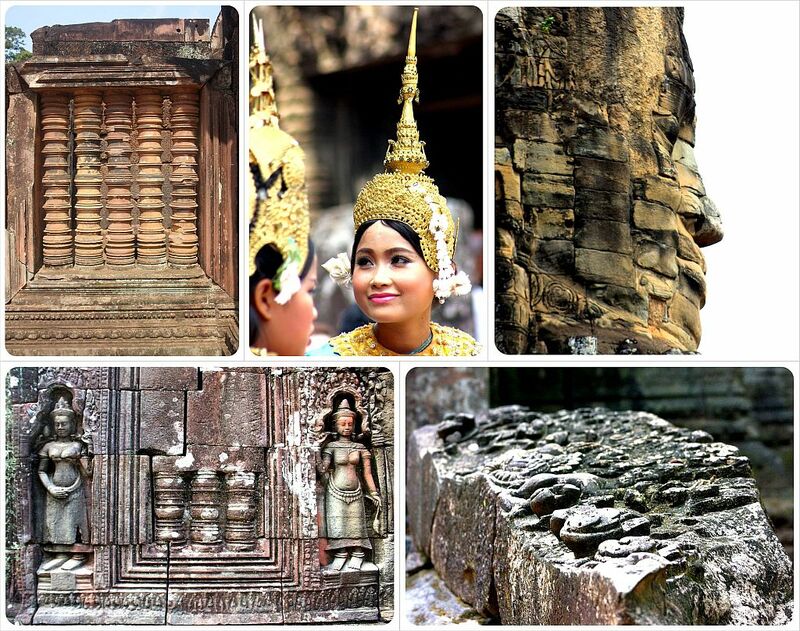 Without our guide, we would have never understood the significance of the 800 reliefs, which are these incredibly detailed stone carvings which relate the history of the Khmer kingdom as well as the myths around the creation of Cambodia. These reliefs so captivate some visitors that they spend entire days circling the walls, sucked in to the ornate, complex works. 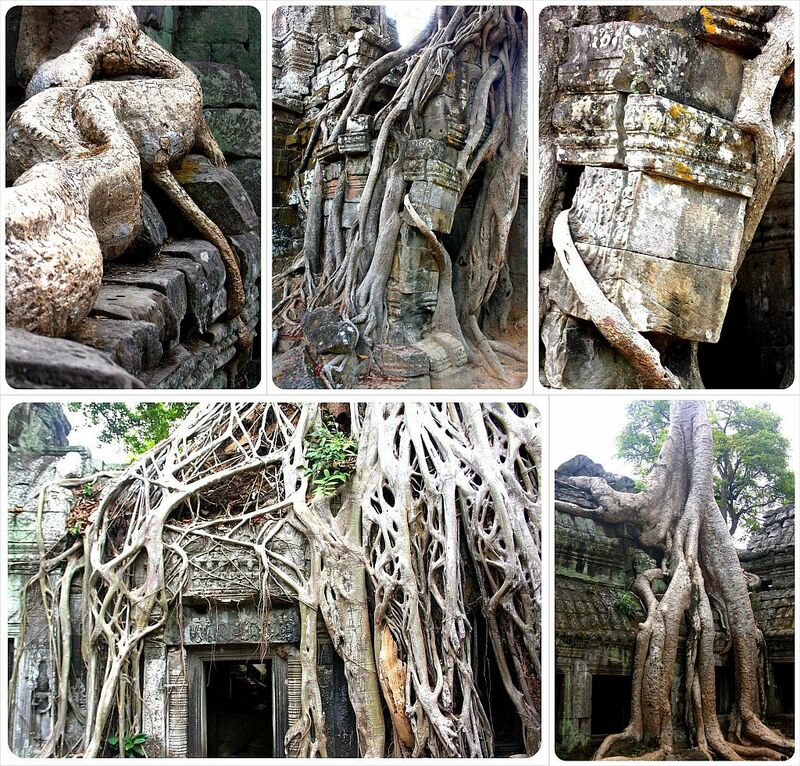 The highlight of our first day is unexpectedly not Angkor Wat, but Ta Prohm – the ‘Tomb Raider temple’. Over time, the massive trees have completely overtaken this jungle temple, with huge serpentine roots intertwining with the stonework of the ancient buildings. Rather than somehow ruining the experience, these massive trees and their incredible root system makes it feel more like stepping in to a mystical, long-forgotten world. Most temples have been cleared of the trees in order to preserve the structures, much to the favor of archeologists, but this was by far one of the most remarkable aspects of our visit to Angkor Wat. We respect that Urban Adventures only employs local guides, but it was difficult for us to understand our guide at times. His English was good, but we found that the subject matter was difficult for him to relay with his command of the language. However, he was a sweetheart and made sure we knew the best places to visit on the remaining two days of our visit. The tour included the price of a one-day ticket, and we were able to upgrade to a three-day pass for only an additional $20 (normally $40). By saving us $20, this effectively knocked the tour price itself down from $70 to $50, a more palatable price. Another option is to hire one of the hundreds of guides waiting outside the temple complexes each day. We heard guides speaking fluent English, along with Spanish, French, German, Russian, Korean Chinese and Japanese. This option is less expensive, expect to pay around $20 for a day for a certified guide. However, you are then responsible for arranging transport (most likely a tuk tuk) to all the sites separately and back and forth into Siem Reap. Again, we recommend hiring a guide, even this way, in order to really gain an insight, at least for one day, to the history of the Khmer kingdom. 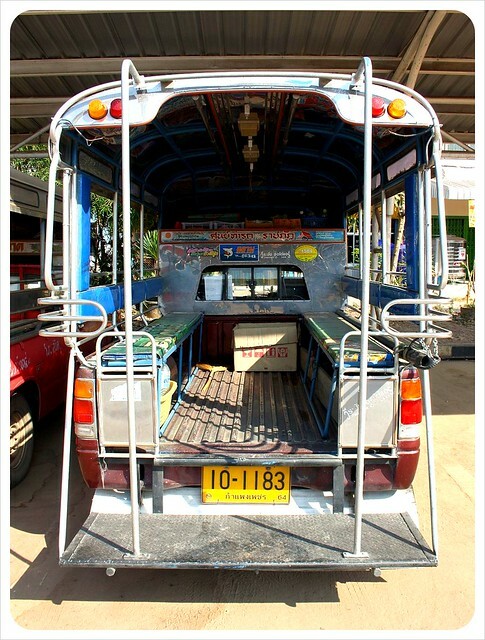 A much less expensive option is to hire a tuk tuk to take you around. You won’t get as much of the history, but you can cover several sites in one day, and the driver waits for you at each stop and drops you off at your hotel at the end of the day. 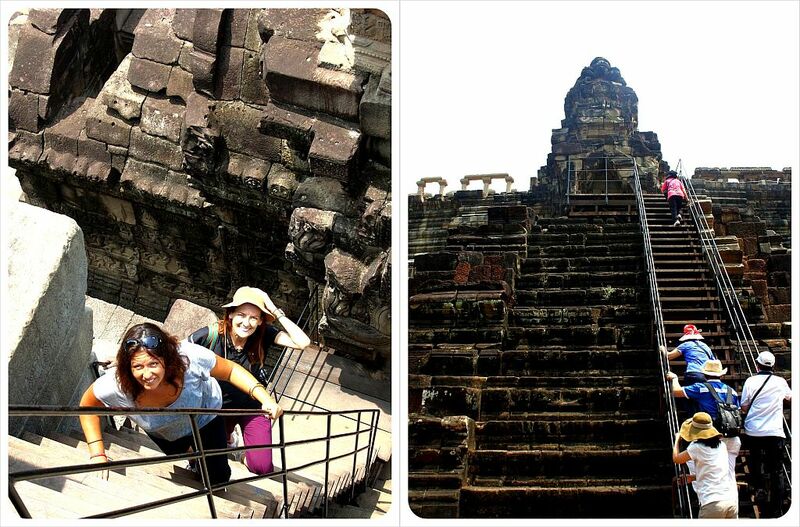 We did this the other two days of our time at Angkor Wat. Agree on a price straightaway based on all the sites you’d like to visit that day ($12 – $15), which means doing all your own research beforehand. Don’t be afraid to bargain, as drivers charging these rates every day are making a fine living by Cambodian standards (teachers make $100 per month, qualified English-speaking managers make $500 per month.) If you decide to ditch the guide, you might want to pick up a guide book at one of the temples – the (copied) ‘Ancient Angkor’ book is sold everywhere for around $5 and has all the details on Angkor’s history, symbolism and background info on all the temples. There are plenty of places in Siem Reap to rent a bike for the day ($1 – $2) to ride out to the nearest sites. To do this, you will have to get up early in the morning, as the heat and humidity make physical exertion impossible in the afternoon. One disadvantage of seeing Angkor Wat by bike is that you can only see the sites nearest to the city. Because we had already seen these on our Angkor Adventure tour, we ended up not renting bikes, which was our original plan. Seeing Angkor Wat by bicycle is the cheapest option, and is both a fun and completely liberating way to see the UNESCO World Heritage Site. 1. If you’d like to see the famous sunrise over Angkor Wat, get up early enough to get a good spot for photos. What nobody tells you is that instead of a few early risers, you will have to fight for the best photo spots with bus loads of tourists. Hundreds of them, in fact, gather every morning to see this famous sunrise. The water basin in front of the main structure makes for terrific reflections, so camp out early for those shots. The best time of year for photos is the dry season between November and March. 2. Don’t start your day at the main Angkor Wat temple. This is frankly because everybody else does. Plus, because the sun rises over/behind the temple, the light is not ideal for photos in the morning. If you head to Angkor Thom and to Ta Prohm in the morning and return to Angkor Wat in the afternoon, light conditions are much better, and the bus loads of tourists will be back at their hotels already. 3. Make sure to bring enough water and snacks. There are vendors at the gates of the main sites, but there were a few times where we were seriously thirsty and no water vendors were around. We visited during one of the hottest points of the year, and were seriously in need of constant hydration! 4. Don’t forget your sun screen. It is hot and sunny in Cambodia all year round and if you don’t like the heat, avoid visiting Angkor Wat between March and May, the hottest and driest months. If you visit Cambodia between May and October, this is the rainy season, so plan your visits to the temples around the (usually) afternoon rain. 5. Don’t get Templed Out – Take a break. There are over 400 sq km to explore, and some of the most beautiful spots are far from the main site. It is worth it to dig in and do some exploring, but don’t squeeze too much in each day or you might suffer from the common tourist symptom of Over-Templitis. Luckily, the 3-day pass can be used over the course of a week, which gives you enough time to plan in other things or just relax in Siem Reap. If you buy the 7-day pass, you can really take your time and use it over the course of an entire month. 6. The most popular spot to watch the sunset is Phnom Bakheng in Angkor Thom – if you’re planning to see the sunset there, get there as early as possible, because those same 1,000 tourists who hit sunrise in the morning will gather for sunset here in the evening. We watched the sunset on top of Pre Rup, with far fewer tourists compared to Phnom Bakheng, but equally stunning views. 7. 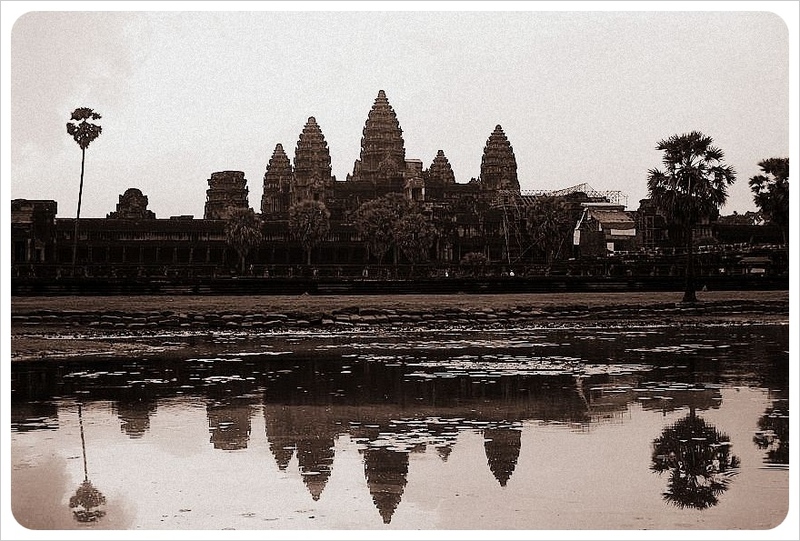 Watch what you’re wearing – Angkor Wat is a religious site, and even though it might be hot, you should follow the dress code when visiting a holy site. This means sucking it up and covering your shoulders and your knees. If you wear a tank top, pick up a cheap scarf to drape over your shoulders. 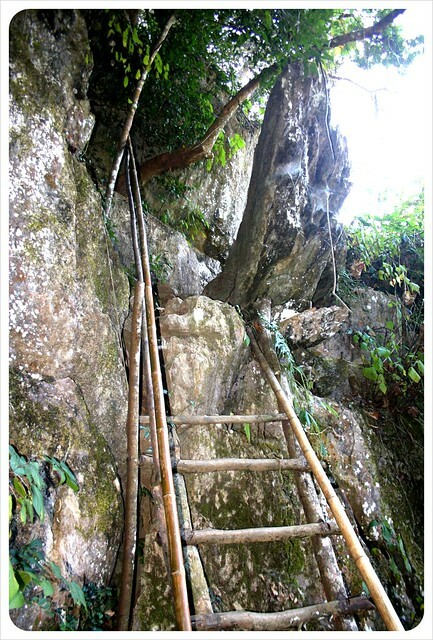 Wearing gym shoes is also recommended, as you’ll end up climbing lots of temples, and not all of them have proper stairs. When we travel, we always have a plan. Not that we stick to it, but we always intend to. It might seem predictable, but the truth is there is a reason why travelers follow a trail, at least roughly. It is because the routes make sense to follow – from north to south or from main hub to main hub, making your stops along the way. There are the times when I just want to pick up the guidebook, point to a page, and go there. 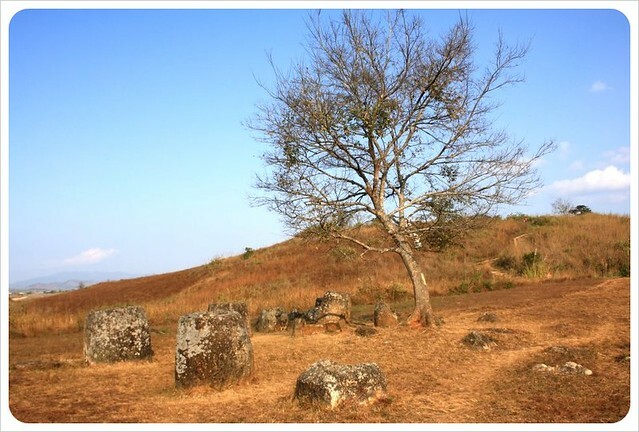 One day at lunch in Laos, while eating a baguette in the French colonial city of Luang Prabang, I was flipping mindlessly through the guidebook, and came upon a place called the Plain of Jars. The name already had me hooked, but the description possessed me. What is this plain filled with jars, I wondered? 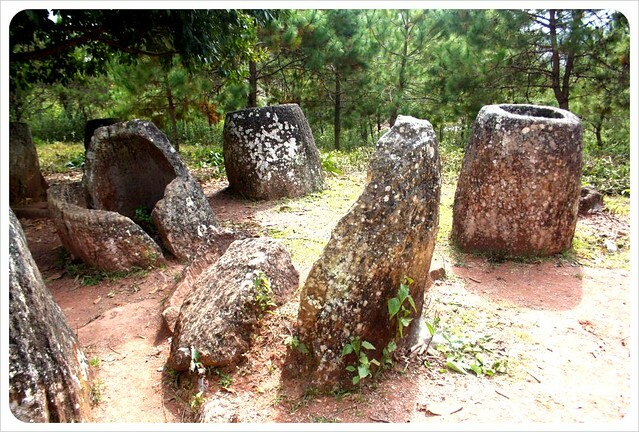 French archeologist Madeleine Colan (re)discovered the Plain of Jars in 1930 (along with a few bones, teeth and shards of pottery) on a plateau in the north east of Laos. 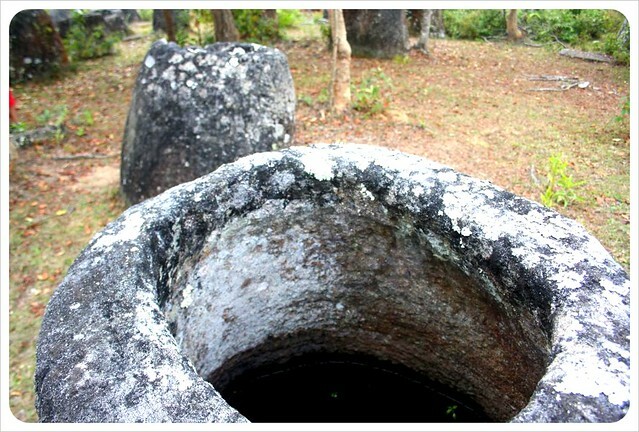 Hundreds of these ancient Stone Age jars reach as high as 3m and weigh between 650kg and one metric ton. Their purpose remains a mystery to archeologists, who have put the site on par with Stonehenge or Easter Island’s Moai statues in terms of mystery and massive size. Now, this is what traveling is all about, I thought. We had to get to these Jars. Despite the extra two days of travel on those nauseating Lao roads, the detour was worth it. 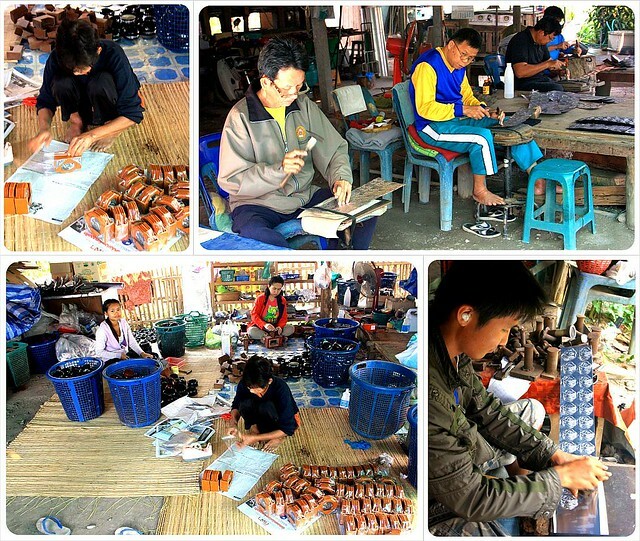 The next day, we were off to see these jars in the Xieng Khouang province. Its dusty capital, Phonsavan, acts as the hub for visitors to the region. Streets here are wide with soviet-style blocks and piles of rubble and bricks on either side. There are only practical businesses, repair shops and a smattering of basic restaurants and hotels. As we arrive in the late afternoon light, the scene is more how we would have imagined a trip to Mongolia. Motorcycle riders with scarves over their faces to block the dust, the cityscape here is barren but you see from the construction that there is prosperity in its future. We loved Phonsavan right away. We set our bags down in a sturdy, basic hotel room off the main road, ready to hunt for some dinner, and the sound of festive music started pounding through the window. 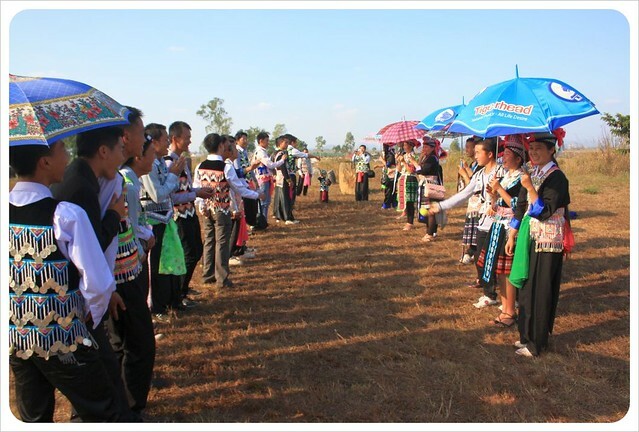 It just so happened that we were not only going to be learning about ancient cultures here in Phonsavan, but also experiencing the Hmong New Year at the same time. 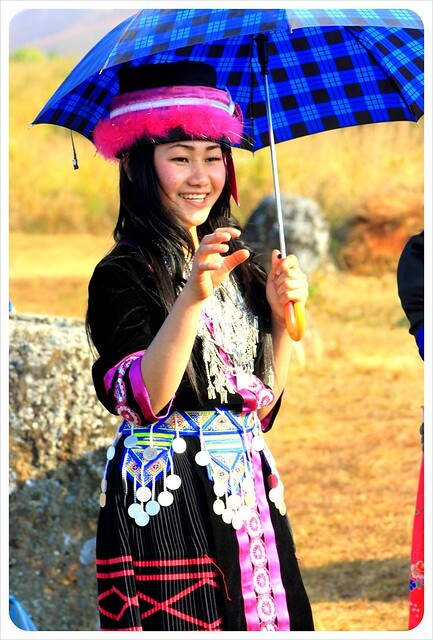 Originating from Southeastern China, the Hmong ethnic group slowly migrated into the highlands of Thailand, Vietnam and Laos throughout the 18th century due to unrest, and outside of Phonsavan is one of the largest Hmong communities in the world. Just near our hotel, a huge open gravel lot was spilling over with Hmong people of all ages, all dressed in their colorful festive best. New Year’s celebrations come at the end of the harvest season and involve up to 40 days of food, dancing and a fun fair. We made a bit of small talk with a trio of Hmong girls eager to practice their English and happily pose for pictures in their beautiful robes for a few minutes. 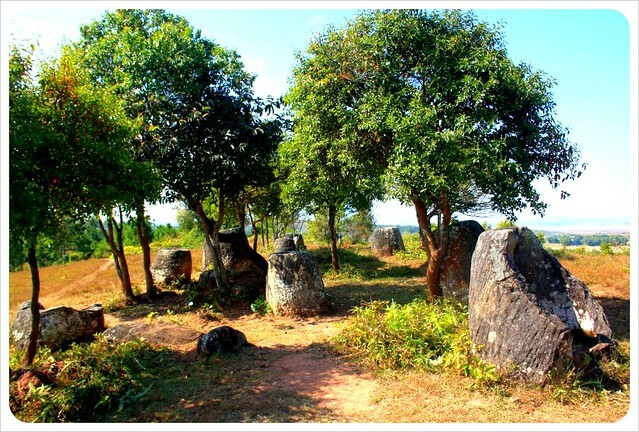 Then it was off to find a guide for the Plain of Jars the next day. Visitors can hire a driver to the main site on their own, but guides are required for sites 2 and 3, not only because of the distance, but also because the area surrounding the two sites is still littered with landmines. We were happy to have an expert with us to keep us safe, but also to tell us more about the history of the jars. Was this place inhabited by giants? 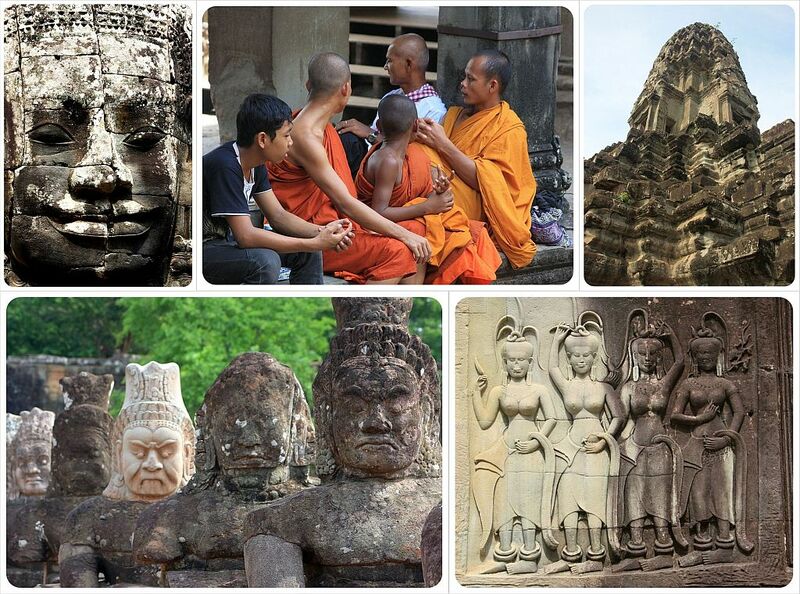 Lao legend claims that the region was populated by a race of giants thousands of years ago. 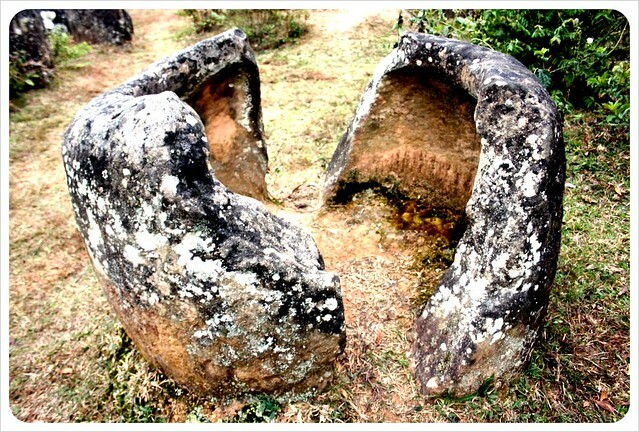 More rational theories suggest that these jars, which date from to 500BC – 200AD, were used as funerary urns to bury to dead, or to catch rain water, or maybe even to brew and store the (in)famous Lao Lao rice whiskey. Unfortunately, few jars today remain completely in tact. Locals have used pieces throughout time for building materials while trees have sprung right up out the middle of others. Many fell victim to bombs dropped here during the U.S.-led Secret War. 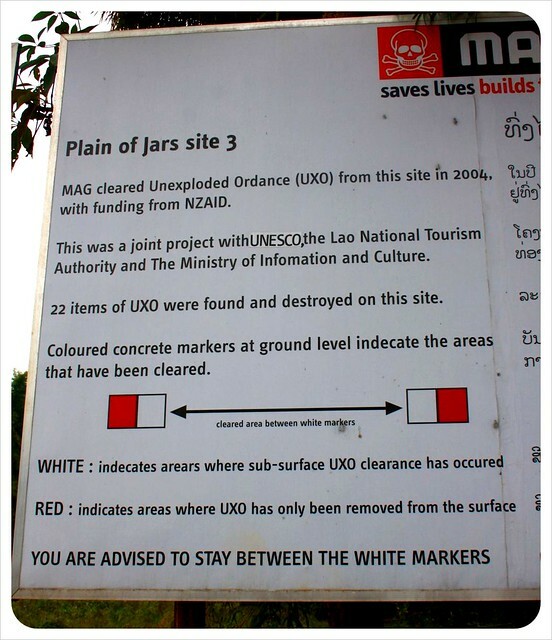 The Laos government has applied for UNESCO World Heritage status for funding to prevent further destruction, but until the thousands of unexploded landmines from that war can be cleared (a dangerous task costing millions of dollars), it is unlikely they will receive UNESCO’s blessing. For such a mysterious and ancient site, there are very few visitors here. 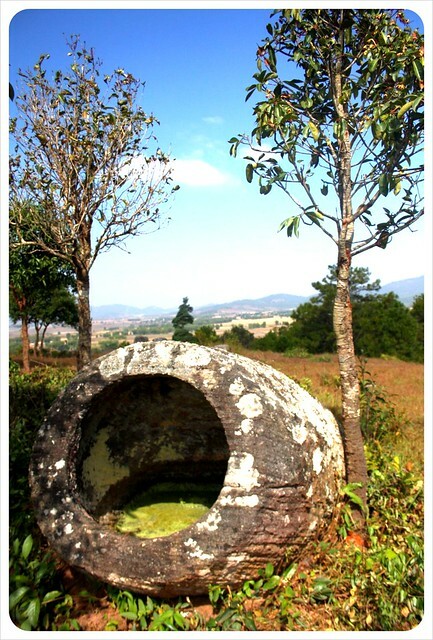 With a twinkle in his eye, our guide explained that as soon as UNESCO status is granted, tourists will flock to the Plain of Jars the way they do to Luang Prabang or Cambodia’s Angkor Wat. After all, everything about these jars is fascinating – their size, their mysterious history and also just how much ground these sites cover. There are three sites, spread over a massive amount of land and we start at the further one, site three, which sits 35km from Phonsavan. After a gut-jostling ride down a series of makeshift dirt roads, we parked at a gate and proceeded to hike fifteen minutes past muscular farmers mucking knee deep through rice fields to the top of a hill where 150 of the massive clay jars are strewn about – that is, if massive 700kg jars can be considered ‘strewn’. Rapid-fire questions immediately started. How in the world were these jars transported up here? How were they even made? Were they made nearby? No one knows for sure, is all we were told. Each jar varies in size, some are the size and mass of a small car, while others are smaller, like a heavy-duty backyard barbecue. Picturing the diminutive ancestors lugging these up a hill is difficult, and it is clear why legend has it that giants used to inhabit the area. After a bit of gawking and talking, we hiked back down and were transported to Site 2. Here there are only 90 jars, spread out across two facing hillsides. The views from here spread deep into the Lao countryside, revealing both intimate village scenes and expansive view that made us feel as if we were the only ones here within one hundred miles. One basic lunch later, the next stop of the tour brought us to a Lao Lao whiskey ‘factory’. This was no more than a house with ten barrels of fermenting booze, a few lazy dogs out front and a charming, older lady who explained through pointing and smiles how this fire water is produced. With our insides still on fire from the ‘whiskey’, we hopped into the shuttle to finally arrive at the main site, Site 1, where 250 jars were waiting. It was officially New Year’s Day, and so we arrived on a most colorful scene as hundreds of Hmong people crowded here at the region’s most significant site to celebrate. Most of us hung back, just observing, until a group of teenagers invited us to join them in what was essentially a hill tribe version of speed dating! 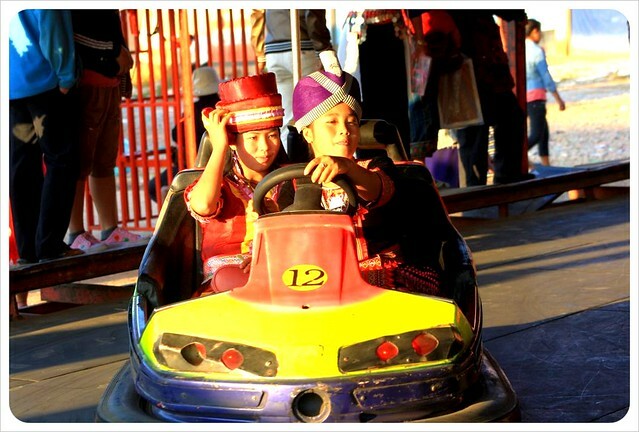 The game is called Pov Pob, the Hmong Game of Love. All in intricately designed traditional outfits, girls line up on one side across from the boys. Tossing a tennis ball back and forth, they throw the ball to someone they like. If caught, that person returns the flirtation. If they let the ball drop, then they do not see their ‘suitor’ as marriage material. The teen boys especially took to Dani’s blond hair and invited her to play, and the girls politely giggled at them for trying. This is the first step of their entire marriage process, so, of course Dani declined and settled for becoming the subject of dozens of cell phone pictures. After all, as traditional as these festivities are, even here in the middle of rural Laos, where there are teenagers, there is a high-tech situation. With mp3 players shoved in the pockets of their traditional outfits, some played Pov Pob one handed while texting, while others recorded the experience on their devices. As for the jars at the main site, they were truly massive and, even after a long day of touring, inspired such wonder as to how in the world, and why in the world, they have been here, since the Stone Age. The tour can be booked anywhere – shop around a bit if you care, prices vary by a few dollars, but they all feed into the same minivans. 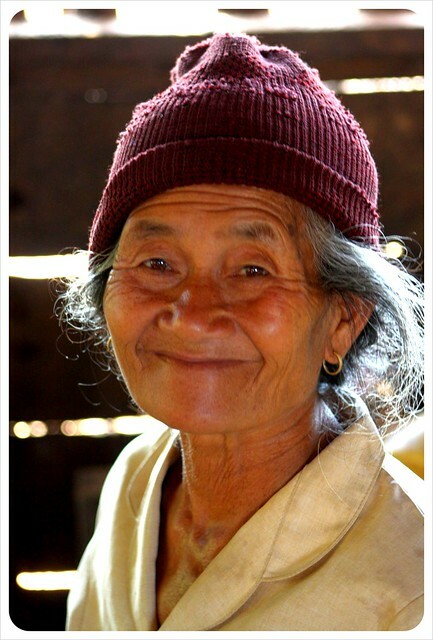 There are a variety of tours which focus more on the Secret War, the Hmong people, and other aspects of life in Laos. 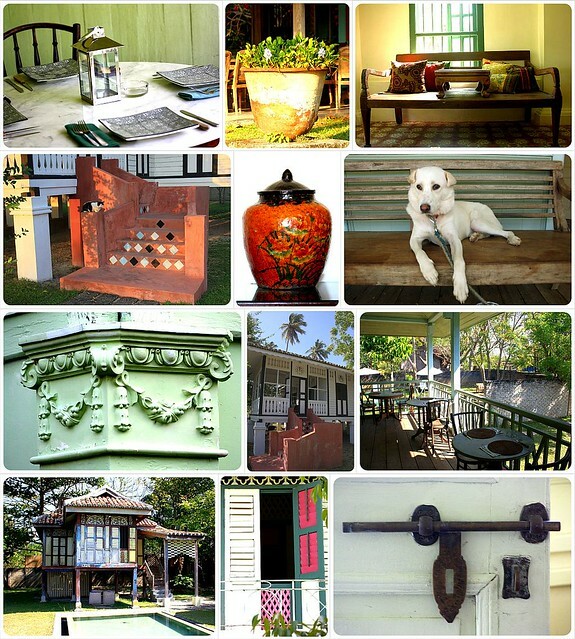 Check out this informative Xieng Khouang website for more. 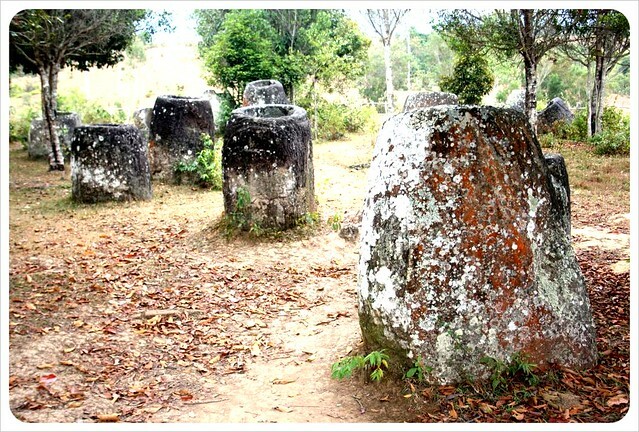 There isn’t much in the way of diversion in Phonsavan, but anyone looking to see the Plain of Jars must overnight here at least once as it is too far from anywhere else. Bomb Harvest: Once here, you might as well at least pop in to watch this documentary. The MAG (Mines Advisory Group) is the organization controlling the clearance of the Unexploded Ordnances (UXO) around Phonsavan. Their office in town offers a daily screening of Bomb Harvest, about the consequences of the heavy bombings and UXO and the efforts to clean up the nearly 200,000 that remain. Phonsavan Daily Market: The daily market the town center of Phonsavan is one of the most interesting markets in Laos, featuring the many unusual culinary specialties of the Xieng Khouang province. 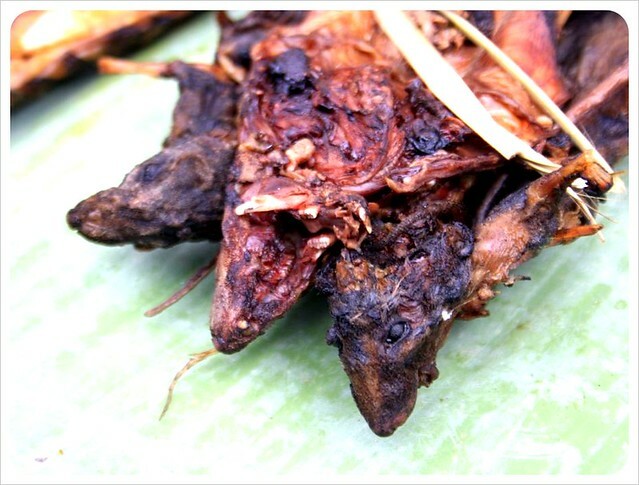 You will see fried bats, colorful birds, squirrels, porcupines and other big rodents ready for cooking. This is nothing for sensitive animal lovers but fascinating for everyone who is interested in getting an insight into local culture. Despite the long journey required from other major hubs in Laos, there are plenty of hotels in Phonsavan. Guesthouses in town offer double rooms for around 100,000 kip ($12.50) and a good selection have (sometimes patchy) Wi-Fi. 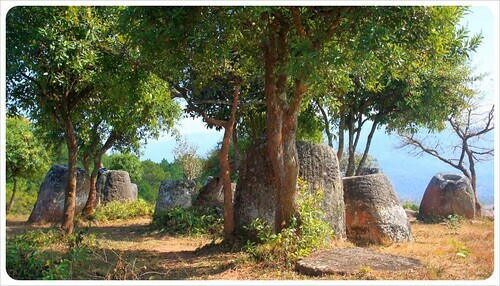 The Plain of Jars tends to attract a more studied (older) tourist, and therefore there are quite a few mid-range hotels as well. We ate breakfast, lunch and dinner at Nisha – a family-run hole in the wall Indian restaurant with plenty of western food on the menu. 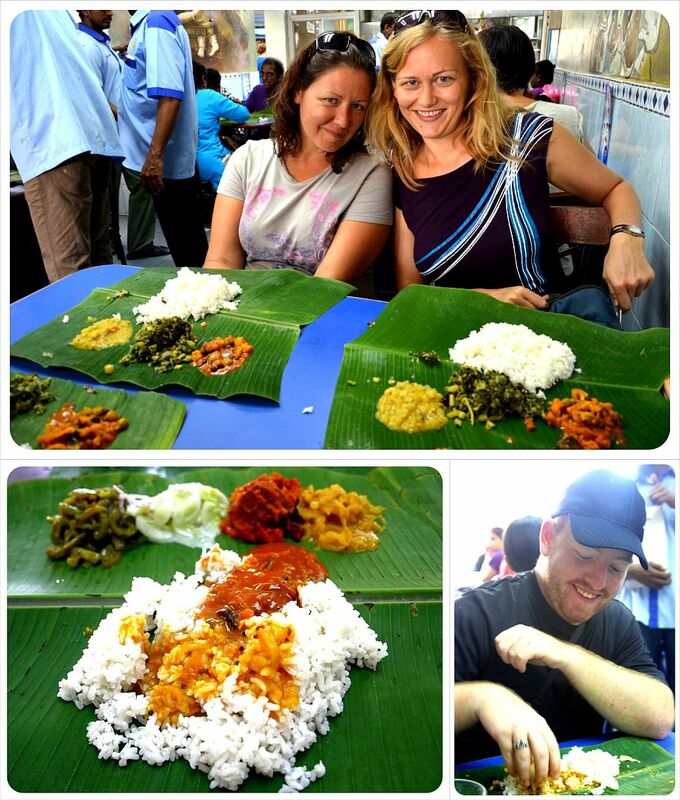 The food is delicious and cheap, and we ran into plenty of other travelers here two and three times. 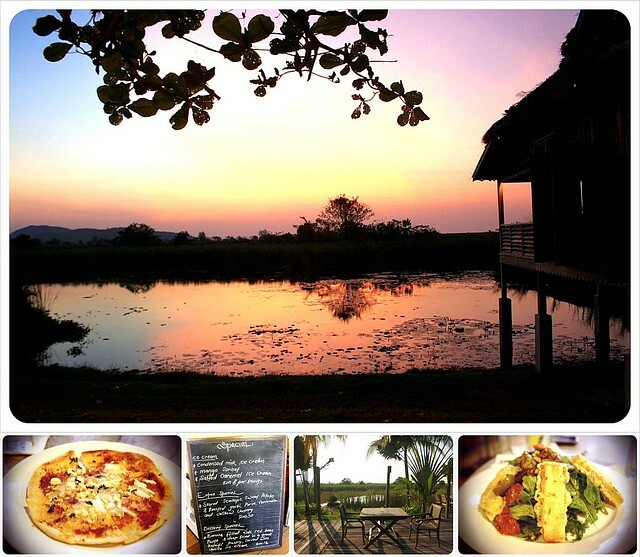 The Craters Bar & Restaurant offers several Western dishes and has free wi-fi, and the Kong Keo Restaurant is rumored to have good local Lao food. Phonsavan makes a great stop on the way to the Vietnam border and can be reached by direct bus from Luang Prabang or Vientiane. Times seem to vary by seasons and weekdays/ends, but we find the Wikitravel entry for Phonsavan very useful. Unlike when we arrived in Thailand, we were entirely unfamiliar with Lao cuisine. Thai restaurants are a dime a dozen in Europe and the U.S., but the only thing we knew to expect about the food in the former French protectorate was that we would be eating a lot of rice. That did turn out to be true, although in northern Laos where we spent our time, we ate mostly sticky rice – and that at least twice a day. Most of the dishes are very similar to Thai cuisine – red and green curries, vegetable stir fries, and even Pad Thai was on many menus. But the breakfasts in Laos were brand new to us – we had never heard of the dishes with names like cheaw makork or khao piak sen. 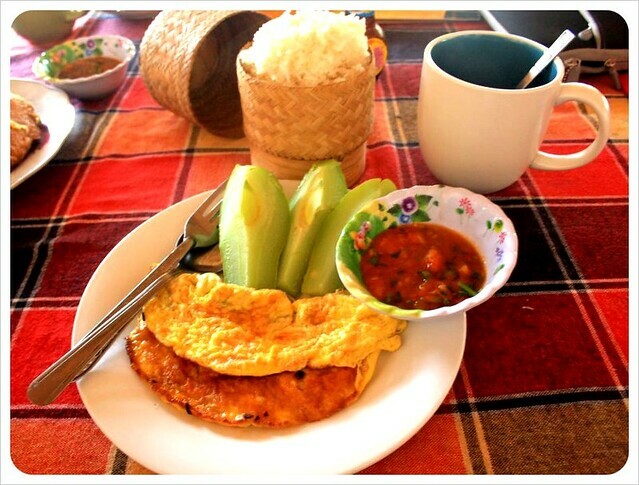 The Lao Garden Breakfast turned out to be a delicious, fluffy omelet with steamed vegetables on the side, served with a little container of steamed sticky rice (khao niao) and a delicious home-made tomato chili sauce for dipping the sticky rice. Like you, we expected to see bread on the table after ordering this, but Warm Lao bread does not have much to do with the bread we know – it is completely made of rice. 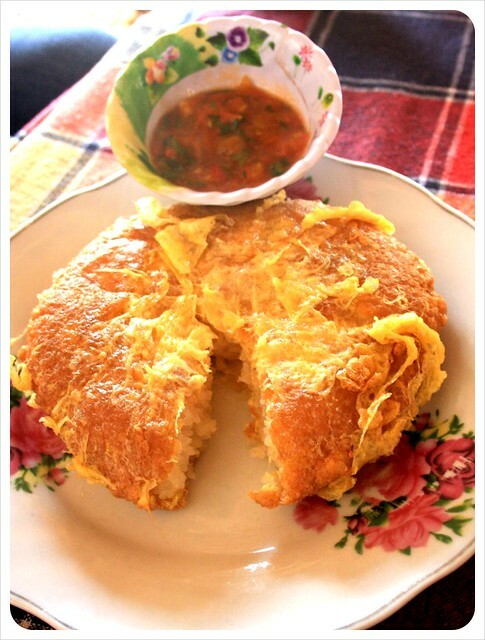 Sticky rice is hand-formed into a large, round inch-thick patty. The patty is then dipped in to a thick scrambled egg mixture, so that it comes packed in an omelet pocket. This is then pulled apart and dipped in the chili sauce. 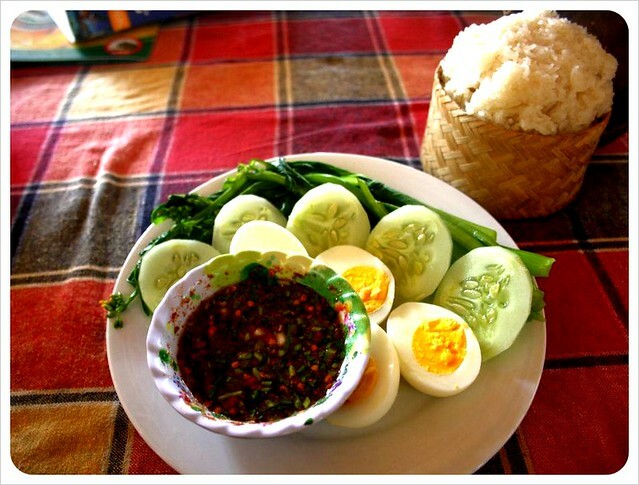 Not only is this cheap and filling, it is one of our absolute favorite Lao foods. Yes, you read that right. 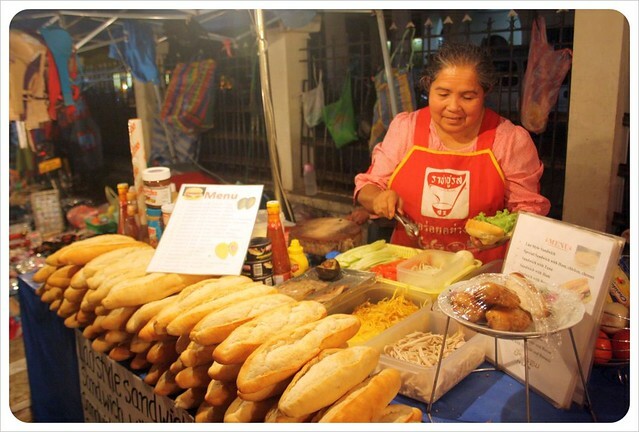 The French influence comes from 50 years during which Laos was a protectorate of France (1893 – 1954), so in addition to crumbling French colonial architecture in cities like Luang Prabang, the baguette still remains a daily staple in Laos. There are baguette stands everywhere, even in rural villages, but rather than a healthy helping of ‘fromage’, these baguettes come two ways. One is the $1 lunch/dinner option – piled high with chicken, ham, lettuce, cabbage, avocado, egg, even plastic cheese singles – and the other is the breakfast baguette, a truly Lao/French fusion food. Here you cut the baguette open, pour half a can of sweetened, thick condensed milk over it, and voila: A simple but delicious sweet breakfast baguette, best enjoyed with a cup of delicious Lao coffee, which also usually comes with three or four spoonfuls of the same condensed milk. Which one of these would you want to try the most? 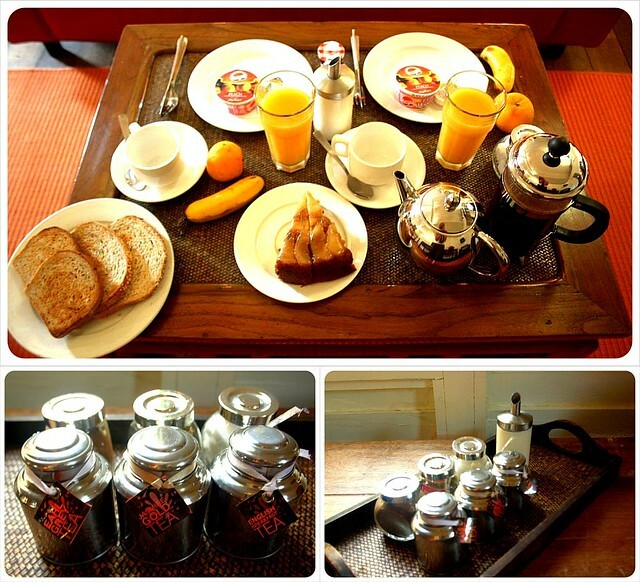 Or have you been to Laos – which one was your favorite breakfast? We had been advancing up the Nam Ou River for nearly an hour, cruising slowly between the white limestone rocks of the mountains that border the river right and left. Navigating the shallow wide river, we passed nothing but lush green subtropical forests, water buffaloes and pigs lazing and grazing on the sandy riverbanks here in northern Laos, and rice farmers waving at us as we went by. 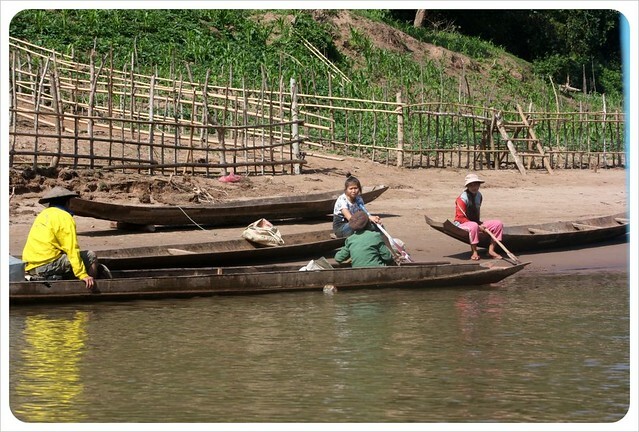 Although our longtail boat had a motor, it resembled the shoddy wooden boats filled with families, fishermen or supplies that float up and down the river between Nong Khiaw, where we were coming from, and a modest, off-the-grid village of Muang Ngoi Neua, where we were headed. The river here is wide, but either side appears almost entirely uninhabited. That was until several houses nestled into the side of a hill came into view, along with a long set of steps leading down to the water. With no roads leading to this remote village, we arrived at Muang Ngoi Neua’s only access point – this simple cement river landing. 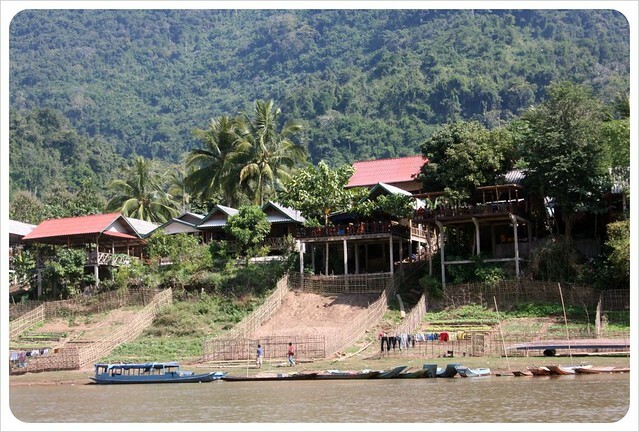 From here, travelers can head three hours north to Muang Khua, a population with town status or the hour back to Nong Khiaw, a place which, had it not been for Muang Ngoi Neua, we would have considered remote and sleepy. But the first thing we notice now is that it is even quieter here. From the river we heard the breeze rustling in the leaves, despite the ten or so of us offloading and the pair of locals who came to greet us with news of their guest houses. We chose a guesthouse, just overlooking the pier. 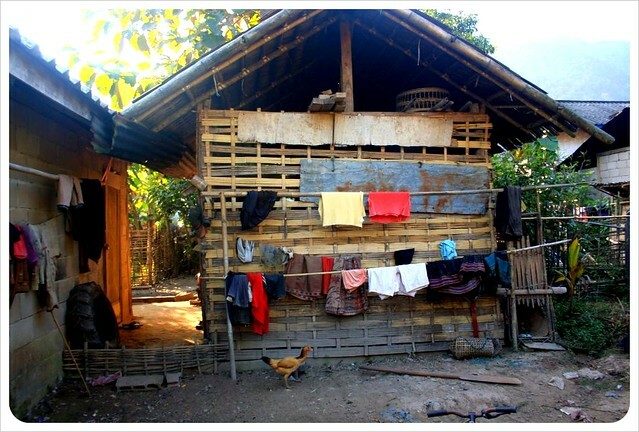 The building is sturdy, walls of thick cement, and the room has a double bed, a bathroom and, like the rest of the village, only has electricity from 6-9pm. We paid the $5.00 it costs to stay here and headed out to explore. Figuring out the set up is simple: one main dirt road too narrow for a car to comfortably pass runs parallel to the river, and a few paths head off perpendicular from there. The main road has several guesthouses, restaurants and shops (one even filled with hundreds of carefully curated English books), the number of which are far out of proportion for the size of the village. This village is just starting to become part of the tourist trail, but only just. At the north end of the street is a beautiful, if unkempt, Buddhist temple. A smattering of lanky white tourists stand out here amongst the dozens of villagers who, as in most of rural Laos, live their lives almost entirely out in front of their homes and shops. Kids play, adults chat, eat or cook sticky rice, workers cut wood or effortlessly carry inexplicably heavy items to and fro, with bicycles – the only form of wheeled transport on this carless island – weave in and out of them all. 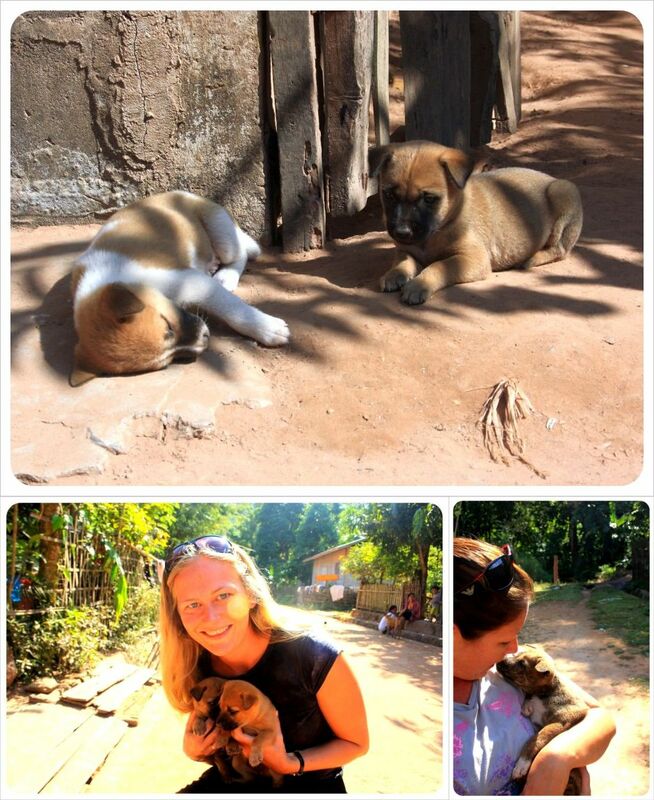 We stopped to play with dozens of cuddly puppies..there are more of them, it seems, than people here. We gasped as a woman walked by with six squirrels hanging upside down on a stick, dead and ready for the barbeque. Another woman laughed at us, but in a loving way, and we felt instantly at home here. Then we decided to head up one of the paths to a set of caves which essentially define the town. Aside from the overwhelmingly idyllic feeling, the mystic river sunsets and the absolute peace and quiet, the truly remarkable thing about Muang Ngoi Neua is that it came close to being wiped entirely out of existence. 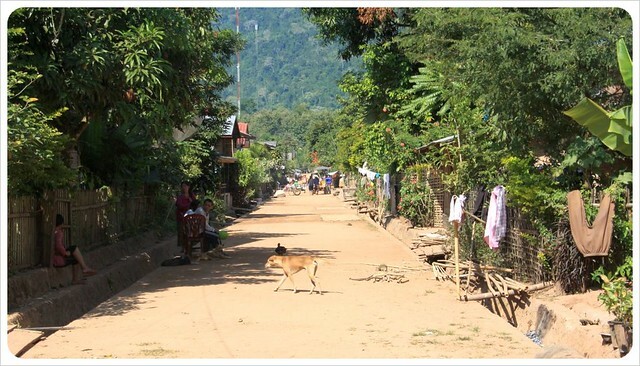 This peaceful village was almost entirely destroyed by bomb attacks by the United States during what is known as The Secret War, a war in which over one million cluster bombs were dropped over Laos. In an incredible tale of survival, the villagers here hid out in several caves high in the surrounding mountains for months at a time. We ungracefully huffed and puffed our way up to these caves, which are now open for visits either independently or on treks with local guides. 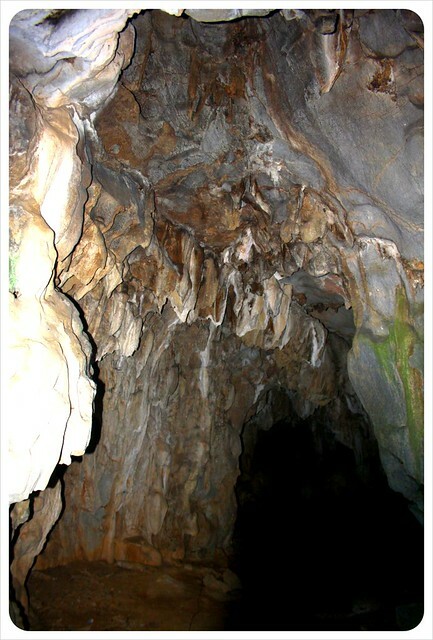 Inside the caves, light shines through high, semi-open ceilings, but it still feels like a damp, black hole, and we could still see utensils used by villagers at that time. I stood teetering on the rocky mountainside as Dani photographed inside the caves and we remarked on how intense our respect was for these people who not only survived in here, but also undertook the strenuous climb on a regular basis, under the cover of night, to replenish supplies. Witnessing remnants of war does not require scaling the mountains, however. Just peek around the front yards in village. 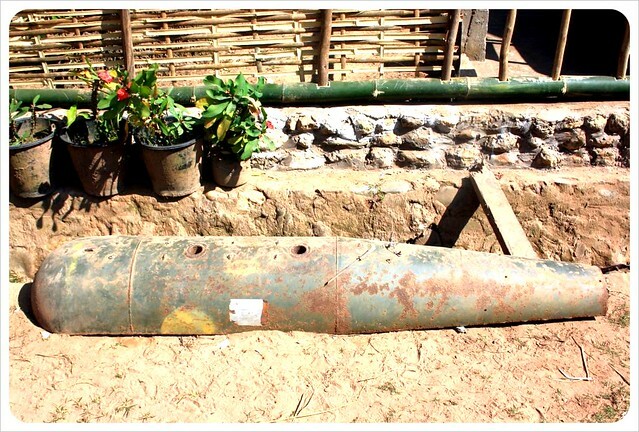 We saw the most ingenuous uses of bomb casings – some used as flower pots, some as fence poles, we even saw a fairly large canoe created out of a bomb casing on our way up the Nam Ou River. There is a layer of sadness here, but the hope and friendly smiles outshine the dark past. After the caves, we wandered through rice fields and forests until we noticed the sun nudging the tops of the mountains and realized it would soon be dark. Here in Muang Ngoi Neua, a place with three hours of electricity per day via a generator, that darkness lays like a blanket over the entire area. In fact, except for the fact that locals all have mobile phones, there are few signs that we are indeed in the 21st century, not a hundred years in the past. Immediately smitten, we both harbored an instant maternal, protective feeling over our adopted village. This explains why we stopped dead in our tracks when we saw a sign offering inner tubes for rent. You see, there is a town six hours down that same river, one that is equally beautiful but much larger, that began attracting tourists several years before. 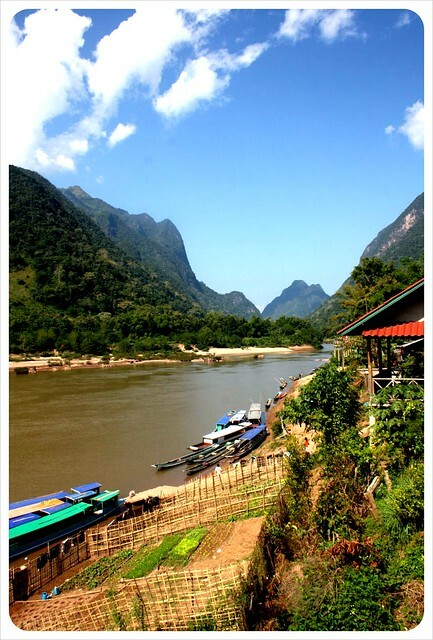 Once a serene village, Vang Vieng, is now unfortunately synonymous with ‘tubing’. Backpackers all around South East Asia can now be seen sporting ‘in the tubing’ tank-tops, proof of their drunken adventures tubing down the river, stopping at bar after bar, smoking joint after joint all the way. Rather than respect the modesty of the local culture, girls unabashedly saunter through town in their bikinis, guys shirtless in their trunks, treating the place like an international frat party. Despite having heard just how spectacular this area is in terms of natural beauty, we were too sensitive to the cultural insensitivity on display here to make the trip to Vang Vieng ourselves, especially since we keep reading disturbing articles on the state of the village. That is why it took everything we had not to tear down these tubing signs and poke holes in all the inner tubes here in Muang Ngoi Neua. The village is not large enough to adequately handle such a huge influx of visitors – not even of the most culturally aware, eco-friendly variety – let alone becoming another ‘in the tubing’ destination. That is why we ask you, we implore you, please don’t go to Muang Ngoi Neua. The people and the puppies might have won over our hearts here…but you know, this an uneventful little place with nothing to do but take in rural village life. Oh and the sunsets are absolutely amazing. The food is pretty good, too. 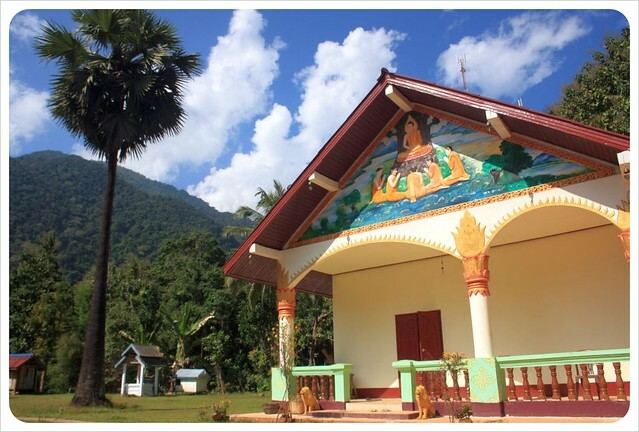 If that is the kind of thing that appeals to you (and who could blame you) you might visit this remote little village in Northern Laos, but promise not to tell anyone else about it…okay? Last Saturday we reflected on the last 100 days which we spent exclusively in South East Asia – Thailand, Malaysia and Cambodia. We came across an interesting observation: while there have been countless ‘Tops’ moments, these last 100 days have had surprisingly few ‘Flops’. Read on for the highs, lows, travel recommendations, fellow online entrepreneurs and bloggers we met and a whole lot of delicious food! When you get to Thailand, you will immediately be bombarded with options to get up close and personal with elephants – but making the right choice is key. If you visit the Elephant Nature Park near Chiang Mai, you will learn about the terrifying torture that work/tourism elephants undergo, a process called ‘breaking’ the elephants, in order to make them docile enough for work (you can learn more about it and watch a video here, but warning – this is heartbreaking stuff). Essentially, they torture the wild out, and then continue to mistreat and abuse these amazing creatures throughout their 70+ years. Luckily Lek, the tiny owner of the Elephant Nature Park has made it her life’s work to save as many elephants as she can, giving them a second chance at a happy life. No elephant riding here, and no circus tricks either. Instead, along with our friends Shannon and Ana, we washed, fed and just enjoyed seeing the elephants in a safe, happy environment amongst friends. This is one of those must-see experiences in life. The extreme nature of the self-mutilation, the bright colors, the loud music, thousands of Indians gathering, worshiping, and some taking as many pictures as the tourists is almost more stimulation than simple minds like ours can handle. 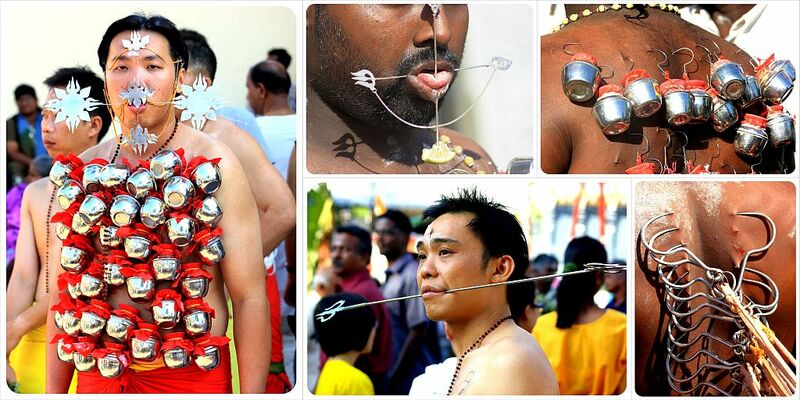 But when we heard that we were actually going to be in Malaysia during Thaipusam, we made sure to be in Penang to experience it. We opted to avoid the 1 million plus crowd expected in Kuala Lumpur, deciding that the over 200,000 gathered at the second biggest procession in the country would do just fine. This was easily one of the highlights of our entire 700 days on the road thus far. Malaysia is seriously sweltering, so the prospect of cooler weather in the mountains brought us out to Cameron Highlands. We thought we’d visit the Boh tea plantation (which we did), have tea and scones (which we did) and visit the Mossy Forest, an area of forest completely covered in moss (which we did). But when we set off for a short morning hike, we did not expect to be challenged the way we were. Initially, the hike was a piece of cake, but by the end we found ourselves hiking up and down steep ravines, shocked each time we passed a marker and had only gone one-fifth of a kilometer. Sinking in to muddy pools with our boots, washing off our faces in babbling brook that caused these extremes, exerting ourselves, the challenge of this hike felt great, as did scarfing down the delicious treats at the nearby strawberry farm directly after. These treats included strawberry sundae, strawberry pancakes, spinach and strawberry salad, even deep fried strawberry ice cream. Keith of Velvet Escape, Mei of Cumi&Ciki, James of Nomadic Notes, Corey of Where’s Waldner, Shannon of A Little Adrift, Christine & Drew of Almost Fearless, Erin & Simon of Neverending Voyage, Raymond of Man on the Lam, Daniel of Canvas of Light, David of MalaysiaAsia, Lauren of Never Ending Footsteps, Dustin the Skinny Backpacker, Betsy and Warren of Married with Luggage, Christy and Kali from Technosyncratic, Lash, Shawna and Chais of Full Course Travel, Heather of Ginger Nomads, Dina & Ryan of VagabondQuest, Jodi of Legal Nomads, Dave of What’s Dave Doing, MonicaMcCarthy, Jen of Directionally Challenged, Tom & Lieve, Alex of Hejorama, John the JetSetCitizen, Ian from Where Sidewalks End, and we’re afraid we might be forgetting a few. To be honest, when we decided to fly to South East Asia last year, we thought we would island hop and beach bum our way around South East Asia. 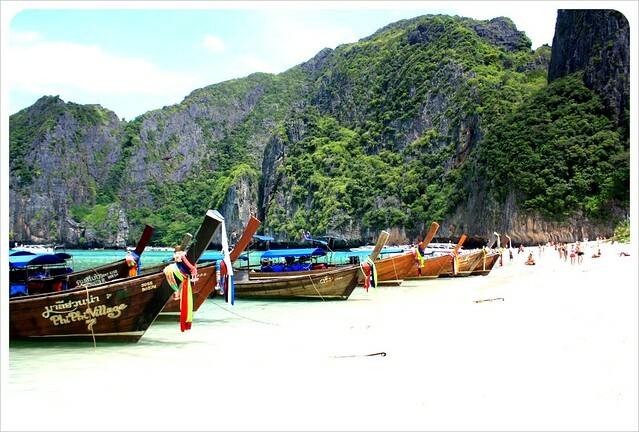 But we haven’t been impressed by most of the islands and beaches – until we got to Langkawi. The island’s Cenang Beach was exactly what we were looking for: white, powdery sand, coconut palm trees and crystal clear shallow water. We spent a couple of days in what turned out to be our favorite boutique hotel so far and, although we meant to move on to Koh Lipe in Thailand from there, we ended up enjoying the laid-back vibe here too much and spent eight days sunbathing, swimming, walking up and down the beach and taking in the stunning sunsets every night. At first glance, Kampot doesn’t look like much – especially if you arrive during midday when everyone is taking refuge from the heat. The wide dusty streets are strewn with building material, as everything in this town seems to be under construction. 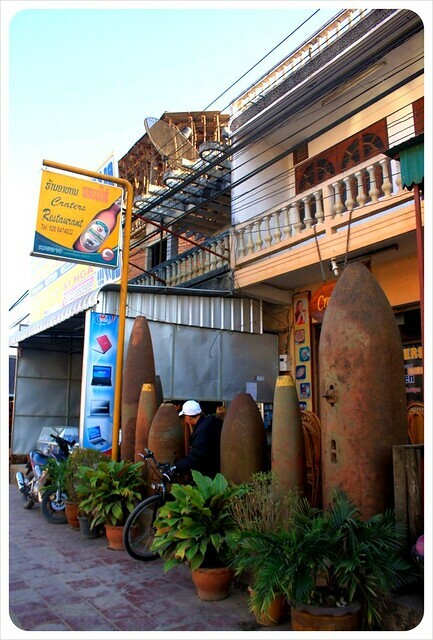 But after a while, this little French colonial city set on the Kampot river really grew on us. The people are so friendly and laid-back, and as soon as the sun starts to set, everyone comes out to play volleyball, cycle and walk along the riverfront. There are tours to see the salt fields and the pepper farms (Kampot pepper is apparently world-famous), and an old Hindu shrine in a cave nearby. All the construction, you soon realize, is due to growth – hotels, shops and a big new tourist market are set to be finished shortly. Go there soon, we say, as this is the kind of city you know is going to feel entirely different in a few years’ time. 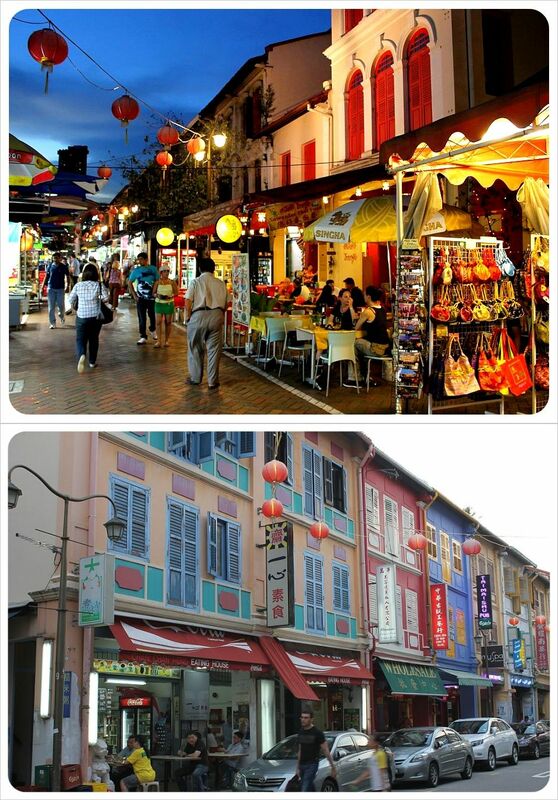 We fell instantly in love with Georgetown, the main town on the island of Penang in the Andaman Sea. 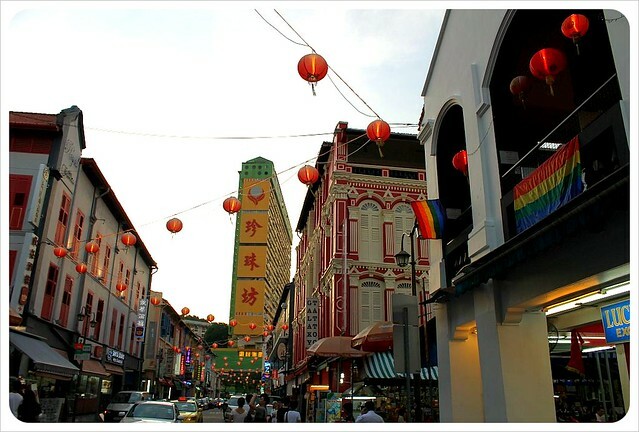 The colonial town is a fascinating mix of Chinese, Indian and Malaysian culture and is filled with Hindu temples, Chinese Buddhist temples and mosques alike. Despite the merciless heat, we explored different parts of this bustling city every day, admiring the charming crumbling architecture and discovering new foods on the many hawker food stands, although we must admit that our stomachs were dedicated to Little India, where we had some of the best Indian meals we have ever had! We were lucky enough to only have gone to one place that we didn’t really like. On the way from the Cameron Highlands to Penang, we made a stop in Ipoh, won over by the description in the Lonely Planet which reads: A town with an elegant lay-out and design…Chock-full of faded tropical mansions and a few green lungs…showcasing elegant colonial architecture and the magnificent train station known locally as the Taj Mahal. Sounds great, right? Well…we were underwhelmed on arrival and increasingly disappointed the more we asked locals what there was to see and their reply was usually, ‘We have a nice mall,’ (which wasn’t very nice at all). After 700 days we’re pretty good at nosing out interesting aspects of almost every place we visit. We can say this: Ipoh seems an easy, nice place to live for families but, as plenty of Malaysians confirmed for us after our visit there, for tourists, Ipoh is no more than quick rest stop on the way to Penang. As we wrote in the 700 days Reflections post, traveling overland still feels like the most authentic way we travel, but budget airlines – AirAsia, Firefly and others – make air travel here in S.E.A. such an attractive option by shaving hours off your travel time for prices that still lie comfortably within your budget. Buses still connect the dots between cities most effectively, trains cover longer distances comfortably but best of all, short and long distance flights are available at incredibly cheap fares. In the last one hundred days, we have taken four flights, three of which were domestic (departure and arrival in the same country). 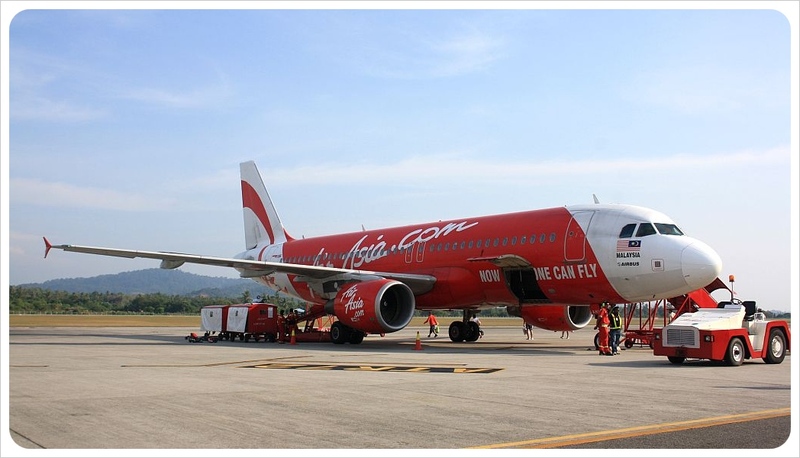 One flight connected us from the Malaysian island of Penang to the neighboring island of Langkawi. Booked less than 24 hours beforehand, the flight cost just a few dollars more than the ferry, but was only 25 minutes rather than four hours of bouncing up and down in the ocean. For $50 we flew internationally between Malaysia and Thailand, and we have booked our flights to India across an ocean for under $100 each as well. On our first stay in Bangkok we made the mistake of staying far away from the Skytrain, which meant we relied on tuktuks and taxis – which are often involved in scams. The Skytrain is clean and new, efficient, cheap at $0.50 a ride, and not only helps you avoid scams, but also the crippling Bangkok traffic jams. When you fly to Bangkok, the Skytrain is the fastest and most air-conditioned way into the city as well! Neither of us loves Chinese food, but on a friend’s recommendation we tried out a veggie buffet at a Chinese temple in Kuala Lumpur and we were hooked! Knowing that everything was meat free, we piled our plates high with veggies, mushrooms, salads, rice and a selection of seitan, tempeh and tofu. The owner of Campbell House recommended a similar vegetarian Chinese buffet around the corner, and for around $1.50 each we stuffed ourselves silly with healthy, delicious food. Our only regret is that we didn’t try this earlier! 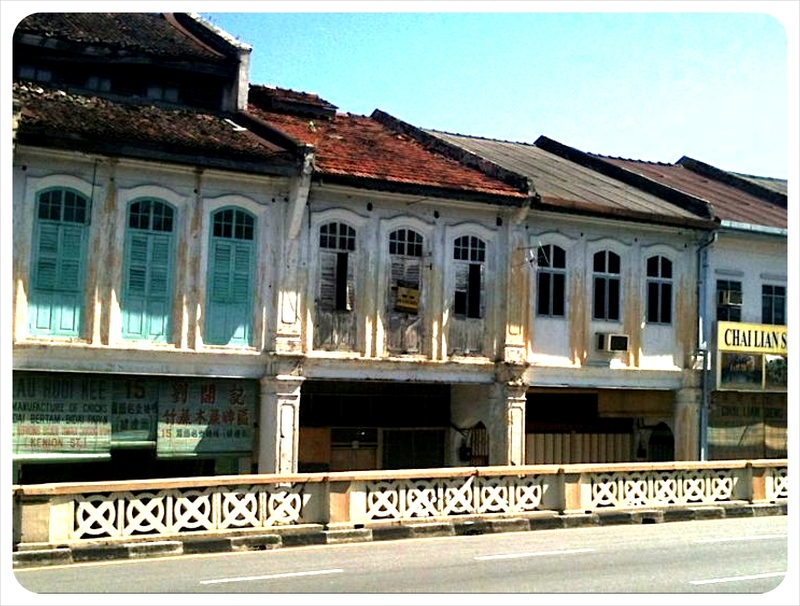 Okay, we wouldn’t recommend a trip to Ipoh, but our stay there was still far from being considered a bad travel moment. To be honest, we haven’t had any bad travel days in the last 100 days. No travel mishaps either! We have thought long and hard, but we couldn’t come up with anything that we could state under ‘mishap’. Of course we picked the wrong hotel here and there, ate a few unexciting meals, but overall, the last 100 days went surprisingly smoothly. Maybe we’re getting the hang of this after all! Preparing for our trip to Thailand, I remember reading somewhere about the romantic Thai rhythm of life. Waking up early, air still crisp and cooking the rice, first thing, so enough is made for the day. The smell of rice fills the house as people sweep floors or clean the kitchen and get ready for work. Chores are done before the brutal tropical sun burns away the light morning dew, before the humidity lays heavy in the air. In the late afternoon, once the sun has receded, Thais water their carefully manicured flowers and plants in lush green gardens. 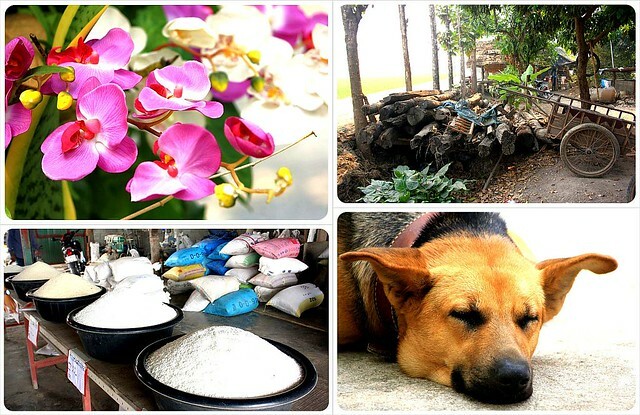 These images stuck with me after arriving in Thailand, even though this rhythm was difficult to find. 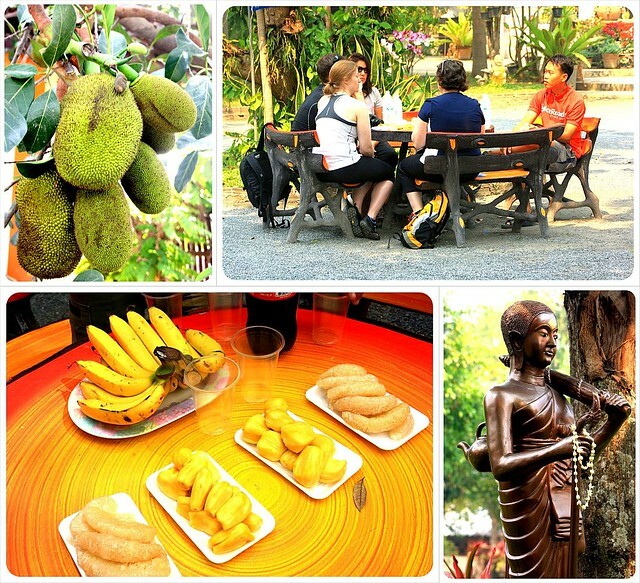 We certainly didn’t find it in buzzing Bangkok and the islands seemed to take on the pattern of tourists. The closest we came to the feeling was during the time we spent in Chiang Mai, although, like the throngs of digital nomads and online entrepreneurs in town, our daily pattern was more about bouncing between cafes and restaurants, working hard and crossing items off to-do lists than soaking up Thai culture. 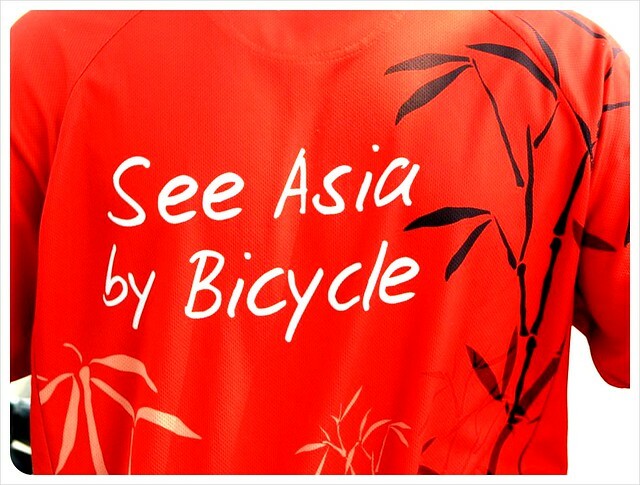 At some point while our heads were down and we were working away, the SpiceRoads cycle tour company got in touch to offer us the chance to join a cycle tour of the Lanna countryside outside of the city. We jumped at the chance, not only to experience more of rural Thailand, but also because of our growing passion for cycling while traveling. On a bike, we are right out in the experience, the smells, the sights, the scenes and the people. Cycling frees us the limits of a bus window as much as it does from the slow pace that our legs alone can take us. The day started early in the morning. Five of us rode along in single file behind our guide, much of the 33km ride spent alone. At each stop, the guide would tell a story, and answer questions. Our first stop was a Buddhist temple with a mummified monk before snaking through peaceful rice fields for miles, stopping at other temples, passing through villages with morning markets in full swing. 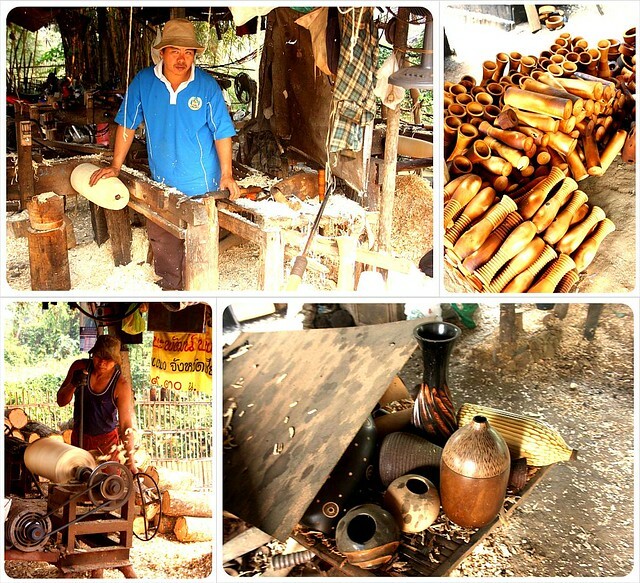 We stopped at small roadside factories where relaxed workers pounded out the tourist trinkets we know from Chiang Mai’s many night markets. Most interesting was watching men whittle mango wood down into beautiful vases at hypnotizing speeds. Looking back on our Lanna countryside cycling tour, what I will remember most is feeling that rhythm of rural Thai life. Catching bright smiles from locals who wave from their stands selling eggs or fruits, honking on their motorbikes as they pass. I can only imagine how we look, all lined up in a row, colorful helmets on, fancy mountain bikes, as people whiz by on all sorts of transport. We come upon smell the onion harvest before we arrive to the field to watch workers load up thousands of onions onto a truck. At some point the road becomes punctuated by more and more hills, and the last five kilometers or so are by far the most challenging. Our guide suddenly picks up the pace, and we are pumping our pedals, pouring with sweat. By now it is noon, and the heat has brought along his friend humidity so add more of a challenge as our legs and lungs burn. And, as suddenly as it began, the hard part is over, as is the cycling tour. We have landed at our final destination: the hot springs. Hot springs are not exactly what you hope for at the end of a 33km ride, but the San Kamphaeng Hot Springs in Mae On are definitely worth a visit, even without the long cycle beforehand if interested in a more authentic Thai day out. The group had lunch together with guide, who was nice enough to order the group a papaya salad for those who hadn’t been in Thailand long enough to sample this quintessentially Thai dish. We splintered off after that to explore the leisure park, with its expansive green lawns, hot mineral baths and hot spring geysers. Dani and I joined the gaggles of Thai teens, glowing old men and their beautiful wives, families with babies and just a handful of fellow westerners all soaking their feet in the warm lazy river. We watched as everyone around us munched on boiled eggs. 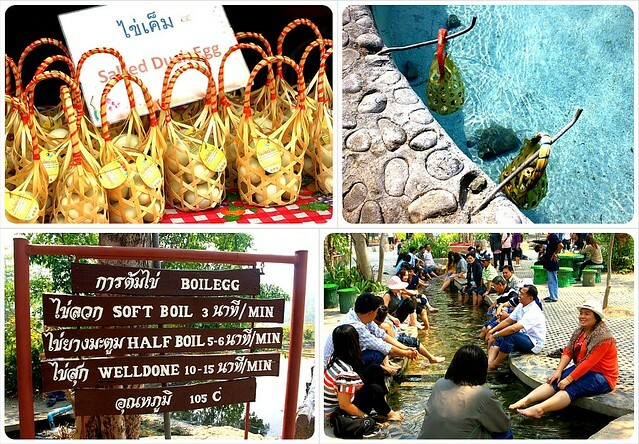 All around the park, vendors sell eggs in baskets, which people boil in tubs of hot spring water. Signs dictate the number of minutes for soft or hard-boiled eggs. Lunch and entrance fees to park were included in the tour, but eggs, drinks and mineral baths were extra. After an hour, the group comes together back at the van, and we are all dropped back off in Chiang Mai. These are the moments we really travel for, these glimpses into everyday life. 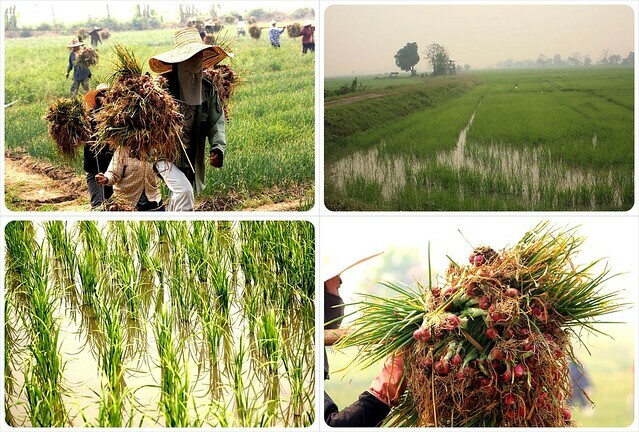 In a year from now, on a Saturday just like the day of our tour, wherever we are in the world, we know about these moments taking place in the northern Thai countryside. 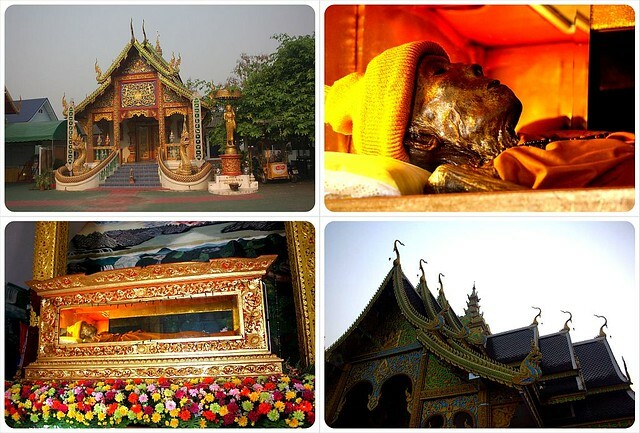 The factory workers, the onion harvest, worshipers visiting the mummified monk, the patterns of life in the sleepy Lanna countryside, and most likely, the small, Spice Roads tour group cycling through. The Lanna countryside tour takes around 8 hours from pick-up to drop-off, but the 33kilometer cycling part runs between 3.5 and 4 hours. Cycling is easy to moderate, with a few hills and mountains at the end. Group size ranges between 2-16, but the guide assured us that there are usually no more than 7-8 on any given tour. Price: 2,500 Baht / US$80 (the same price as almost any tourist undertaking in Chiang Mai – Tiger Kingdom, Nature Elephant Park, etc). 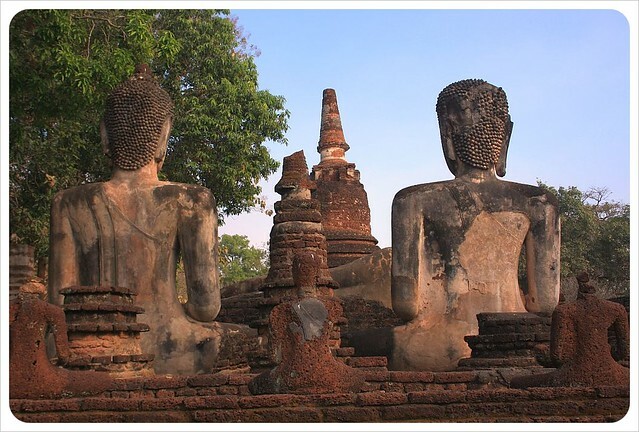 Visit the SpiceRoads website for more information on other tours from Chiang Mai, northern Thailand, Bangkok and other destinations in Asia such as Laos, Vietnam, Philippines, Burma, China, India and Japan. The Navarat is an old-school 1970s-style monolith of a hotel in Kamphaeng Phet, a small city in central Thailand. Our door seemed to be the only one that opened and closed with any regularity at all, though we had spotted a few Thai businessmen mulling around the lobby earlier. With only one other half-empty hotel in town (the once-grand Chakungrao Riverview Hotel) and not an English restaurant menu in sight, it is clear just how few tourists visit Kamphaeng Phet. And yet, Kamphaeng Phet is home to magnificent ancient ruins. 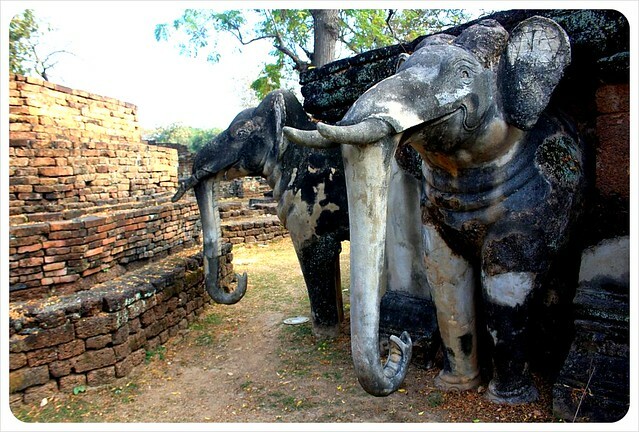 In fact, the Kamphaeng Phet Historical Park is one of the ‘associated historic towns’ in the very wordy ‘UNESCO World Heritage Site Historic Town of Sukhothai and Associated Historic Towns’. The equally magnificent site at Old Sukhothai, about two hours to the east, is smack dab in the middle of the well-beaten tourist path. Here in Kamphaeng Phet, however, we had an entire ancient archeological site to ourselves. So why is there no tourist trickle to Kamphaeng Phet? We are honestly not sure. 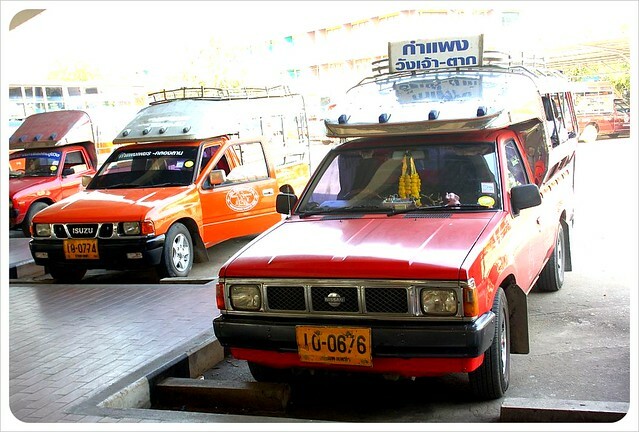 One reason might be is that while Sukhothai has buses running to and from Chiang Mai in the north and Bangkok in the south, the only way to get to Kamphaeng Phet is by a shared Songthaew (covered pick-up truck) ride. It took us a bit of poking around in Sukhothai to even figure out how to find those, which we found to be an entertaining 2.5 hour ride watching locals hop on and off with groceries, bamboo baskets or brand new pop CDs, gossiping cross-legged on the benches along the way. We were the only ones to take the whole Sukhothai-Kamphaeng Phet ride, and the driver dropped us off in front of one lone tuk-tuk when we pulled into town. At first, we assumed it was her brother or friend she wanted to hook up with a deal, but in the end, we realized the favor she did for us, as getting around town is as hard as getting in. Taxis and tuk-tuks in town are nearly non-existent. Our hotel receptionist would have known that, but made no real effort to assist us. She, like the rest of the staff, spoke no foreign language at all. Communicating was done by a lot of pointing and giggling. 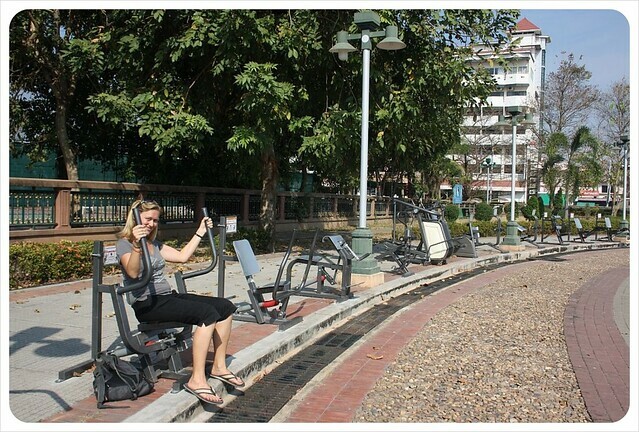 Instead, we flagged down a passing songthaew and said the name of the park. Somehow, we ended up at the main bus station outside of town. Amid the ensuing confusion, we tried to make our needs clear to several drivers, none of whom understood. One brought us to a booth, conveniently labeled “tourist information”, where a lady gave us a map and pointed to gate 5. After 30 minutes of fascinating people watching (bus stations are perfect for this), our feet were getting itchy – where is this songthaew she had promised? After asking a second time, she said thirty more minutes. 30 more minutes? There were songthaews pulling in left and right, surely one would take us to the ruins? Yes, our Thai is limited. Yes, we had been spoiled down on the Thai islands, and in Bangkok, and Chiang Mai where so many Thais are practically bilingual. But language wasn’t even what was holding us back. The strange thing was that the ruins were plastered all around the bus station, on advertisements for a cell phone company, on the maps of the city, on the brochure she had given us. We could easily point to where we wanted to go, and yet it seemed like such an out of the ordinary proposition to get there. Eventually we did get there, and spent the afternoon cycling around incredible chedis and statues of Buddhas and elephants, in utter peace and quiet. The thing is, Kamphaeng Phet is no rural village. It is a modest- sized city set overlooking the Ping River. Infrastructure here is strong, with engaged locals who are educated and active. 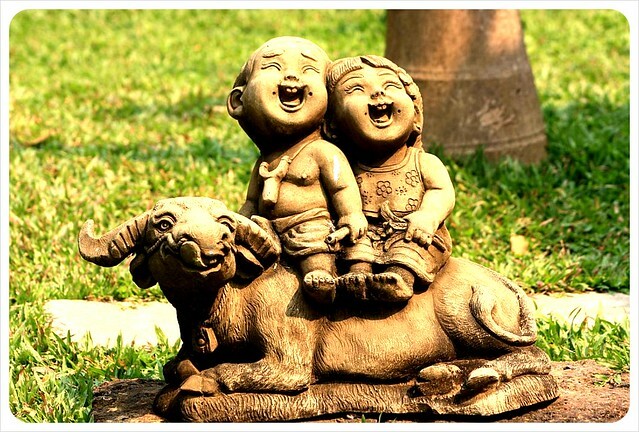 There are dozens of schools, Buddhist temples and plenty of cute restaurants and quality cafes, useful shops ranging from lazy barbers to laptop shops. 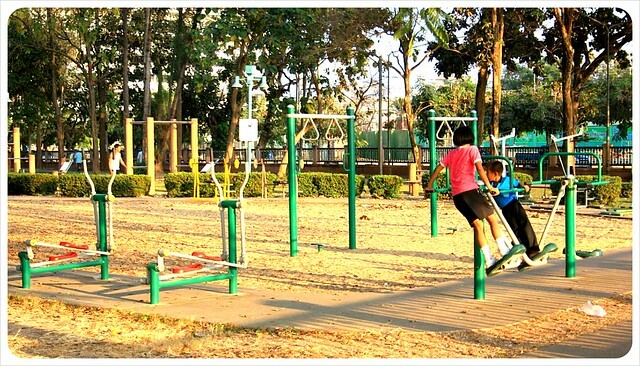 And our favorite part is that the whole town is practically one big outdoor gym. Along the river along we counted five outdoor gyms in the parks throughout the city center. Life is great in Kamphaeng Phet. 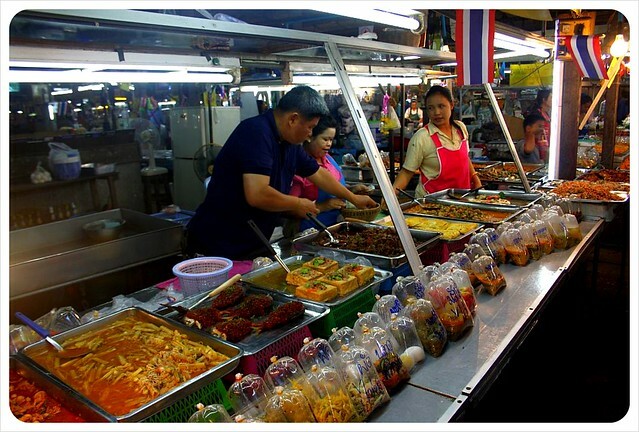 The city is as typically Thai as to be found in Thailand, without all of the plastic tourist trinkets to confirm it. You won’t find a fridge magnet or T-shirts that say I heart KP, and you won’t be getting a postcard from us from Kamphaeng Phet Historical Park as we did not find a single one in town. During online research, all of the web resources we trust came up short as well. Wikitravel has no details about the city, Lonely Planet mentioned a bit about transport links only and the same pair of hotels came up across all the booking sites as well. 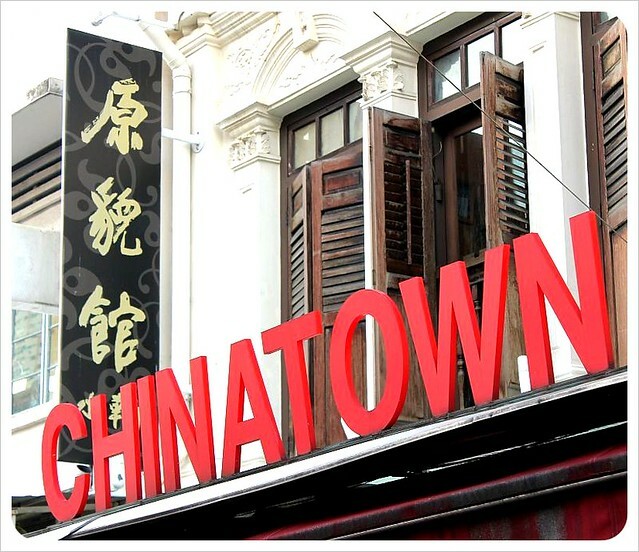 Forget any foreigner-friendly foodie spots either. Restaurants here, and there are tons of them, set out to please their local clientele only. We walked all the way back to the hotel that night along the river, as the sun set that evening and caught such a refreshing glimpse of life in Kamphaeng Phet: joggers along the river, families in the playground, large groups sweating it all out at outdoor aerobics classes (which looked like the international Zumba phenomenon) or pumping iron at the outdoor gyms, kids in school uniforms with parents in suits and dresses on motorbikes arriving at the market for dinner. Perfectly friendly to us, the kids waved enthusiastically as they rode by on bikes, and the market stall vendors smiled as we took pictures of the frogs on sale in the market. But no one there was making a living off of tourists, no one catered to our needs at all. 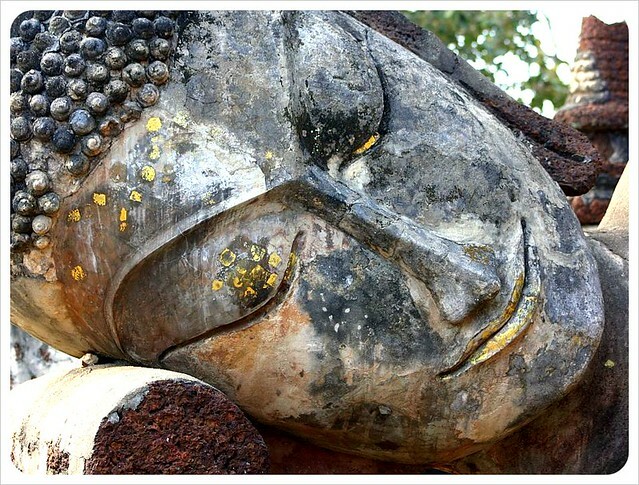 In fact, no one really could have cared less that we were there, and we loved Kamphaeng Phet more for it. This post was made possible in part by Aqua Resorts, the premier boutique Hawaii hotel chain that provides a wide range of Waikiki hotels and Hawaii resorts for all types of budgets. Visiting the beach, or rather The Beach was a must for us while we were in Thailand. Few movies/books have played such a role in our wanderlust as Alex Garland’s novel-turned-Leonardo DiCaprio blockbuster The Beach. 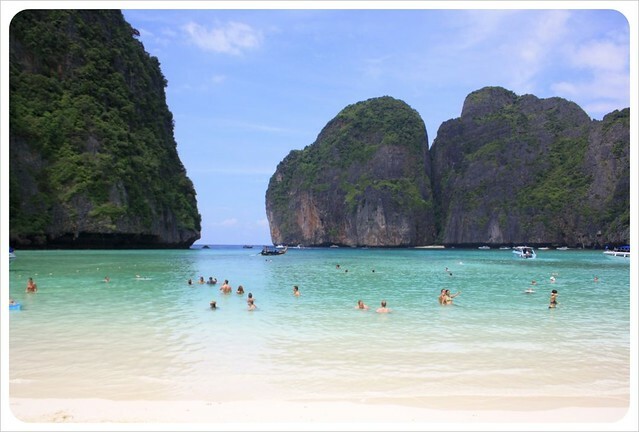 So we couldn’t have been more excited to see that jaw-droppingly gorgeous, secluded Maya Bay in person. It turns out, we almost wish we didn’t come here at all. After disembarking from our ferry from Koh Lanta, we weaved our way through the narrow streets of Koh Phi Phi, which, rather than any sort of tropical paradise, was cluttered with cheap hostels, overpriced guest houses, souvenir shops, dive shops, internet cafes, tour agencies and western/westernized restaurants. Where were all the Thais? And while we’re at it – where was anyone over 30? This isn’t what our experience was supposed to be like. We’re not entirely naive. 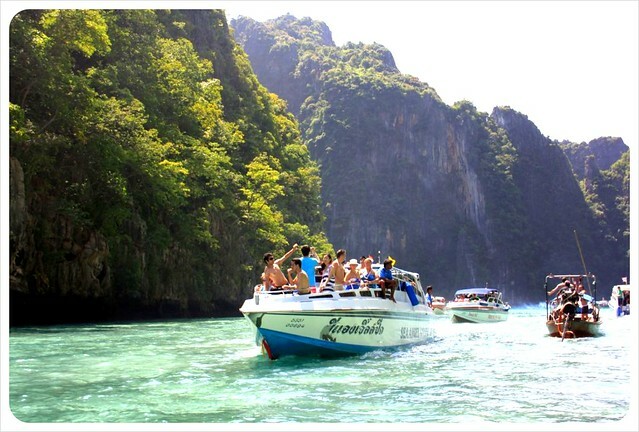 We came over on a ferry with at least 200 people, so we knew that Koh Phi Phi and Phi Phi Lei were not exactly undiscovered. 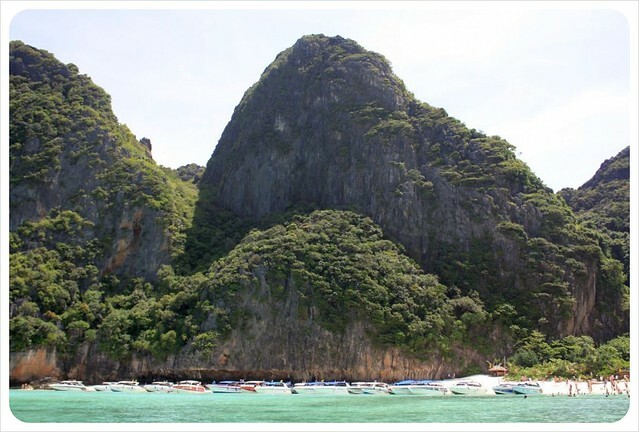 Now here we were on nearby Koh Phi Phi, experiencing the polar opposite of the description above. 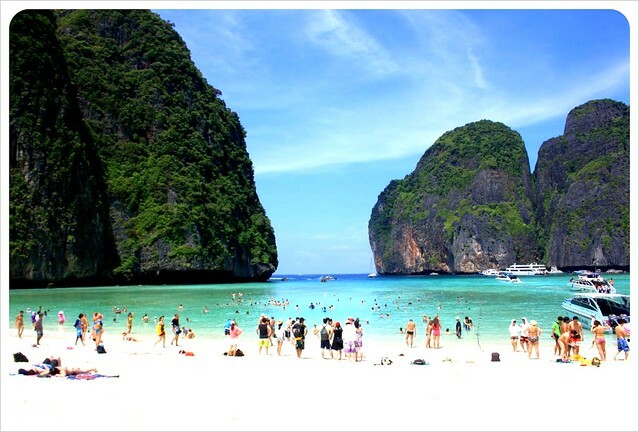 Dozens of travel agencies were ready to sell us tickets to boat tours to Maya Beach, posters with Leonardo DiCaprio’s face plastered on them urging us to experience ‘The Beach’. But damn it we had made the decision to come here, and committed to seeing what The Beach looked like in real life so we booked a snorkeling tour around Phi Phi Lei, which included a mandatory stop at Maya Bay. The first stop on our tour was Monkey Beach – one of the most disgusting real-life example of apathetic animal abuse either of us have ever seen. 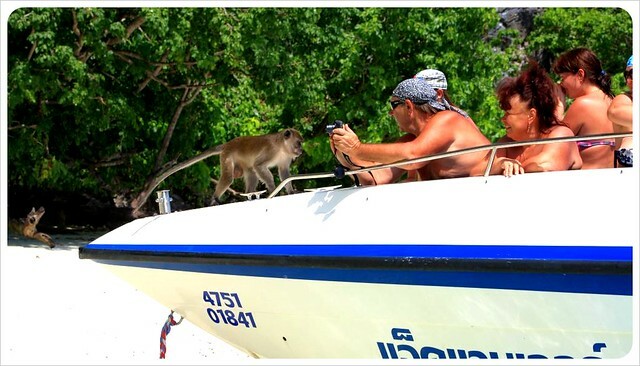 The beach is inhabited solely by monkeys, who, upon seeing our ramshackle wooden boat arrive, sprinted and jumped on board. Instead of some fresh fruit or other monkey-friendly food, our soulless tour guide opened up a bag of chips and starts tossing them over the side of the boat one by one to get these extras from Outbreak off our boat. 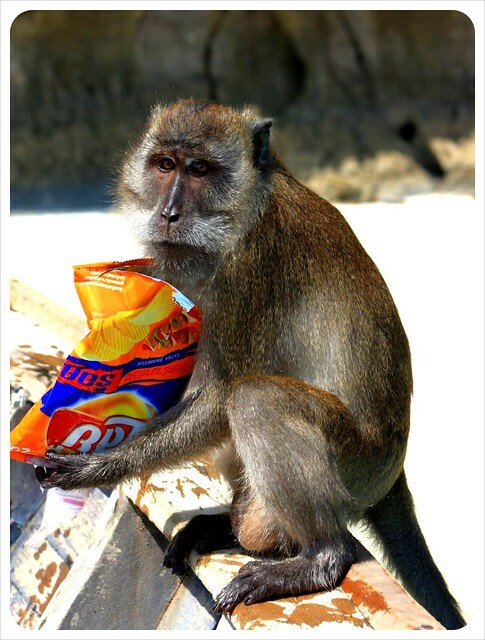 The guide threw the empty bag right onto the beach, leaving it for the trans-fat addicted monkeys to tear apart. Some people had jumped off into the water to feed the monkeys as well, and one man, let’s call him Big Fat Foreigner, complained of a monkey bite as he got back on the boat. Ah, yes, Monkey Bite, said the guide. 35 people got bit yesterday, too. All we could think was – thanks for the warning, buddy. So now that our hearts have sunk into our stomachs, we were unenthusiastic about the snorkeling stop that came next – and we would stay that way when we saw over 20 boats lined up in traffic – yes, actual traffic, in the main snorkeling areas. The water smelled of gasoline, a Chinese tourist on our boat thought nothing of throwing his empty pack of cigarettes in the water, and though we saw small schools of tropical fish, the coral was barely surviving. 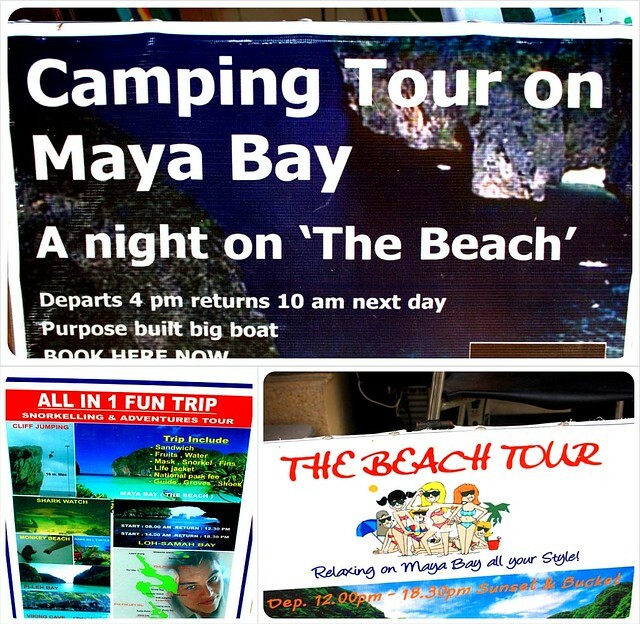 Finally, already entirely disenchanted, we arrived in Maya Bay. Those who know the film may remember that The Beach was closed off to the ocean by massive rock formations around the bay, and it was entirely isolated. In reality, that closed off feeling can only be seen from one specific angle, otherwise it is completely open to the ocean. And anyway, speedboats and mini-yachts lined up on side of the beach, long-tail boats on the other. 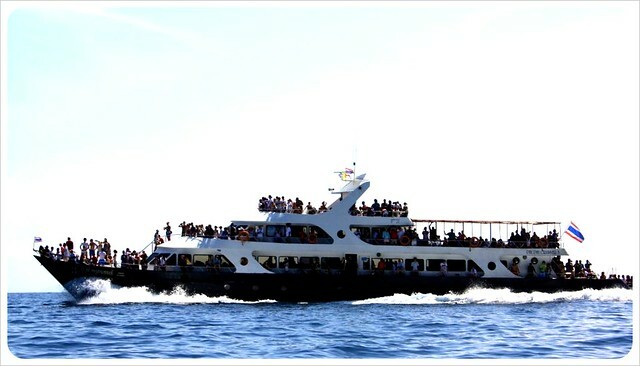 All together, the boats took up two-thirds of the shore, leaving hundreds of tourists to float in the remaining stretches of warm, knee-deep water. Rather than that idyllic white sand beach where Leo and friends played beach volleyball, or where the Swedes emerged from the water trailing gallons of blood after that infamous shark bite, this beach resembled more Spain’s Costa del Sol in the summer. We were given an hour to mull about, take pictures, buy ice cream and gawk at the hundreds and hundreds of tourists – undoubtedly fans of the film or the book. Not that we place any blame on the author Alex Garland. 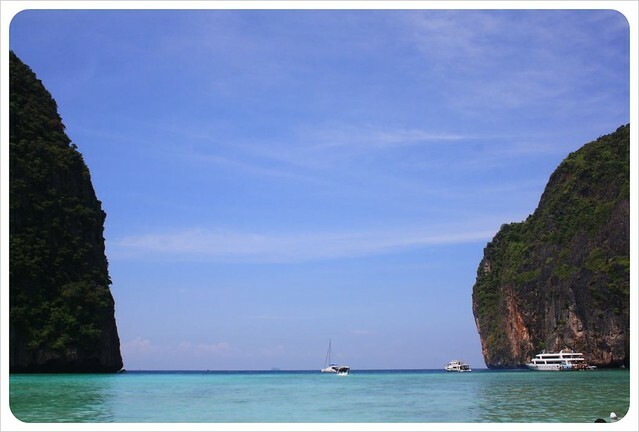 After all, he places the island in the Gulf of Thailand, not the Andaman Sea. The location scout who discovered Phi Phi Lei isn’t to blame either – he did his job amazingly well. This was the perfect location for the film (and yes, we know that these pictures reveal stunning sights. We’re not trying to sound spoiled here, it was just the antithesis of the romantic notions of travel in the book/film). To be fair, there is no single person, no agency, no one to blame for the overrun beaches, polluted water and unhealthy monkeys. When tourism opportunities spring up for newly popular destinations, individuals jump at the chance to maximize profits and run successful businesses. We just hope that lessons have been learned from this and that in similar situations in the future, sustainable tourism is fostered, encouraged or even made mandatory. We know that we have certainly learned a lesson out of all of this…don’t expect reality to match a work of fiction. Have you been to The Beach? What did you think? Of all the hotels in all the cities we have visited, we have never stayed anywhere quite like this resort. The property consists of eight antique villas from various Malaysian states, which were meticulously taken down piece by piece, sent to Langkawi and rebuilt here on site. 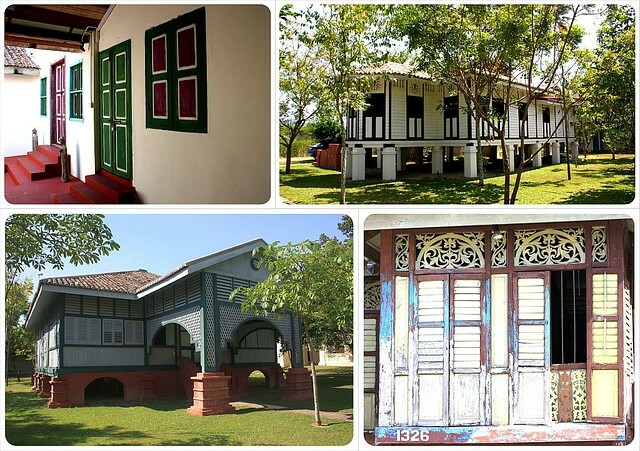 The collection of houses are as multicultural as Malaysia itself – with representations of Chinese, Malay, Indian and Eurasian styles. Each villa is individually designed, with a rough-luxe style that left us giddy when we first walked in to our loft in the Oriental building. 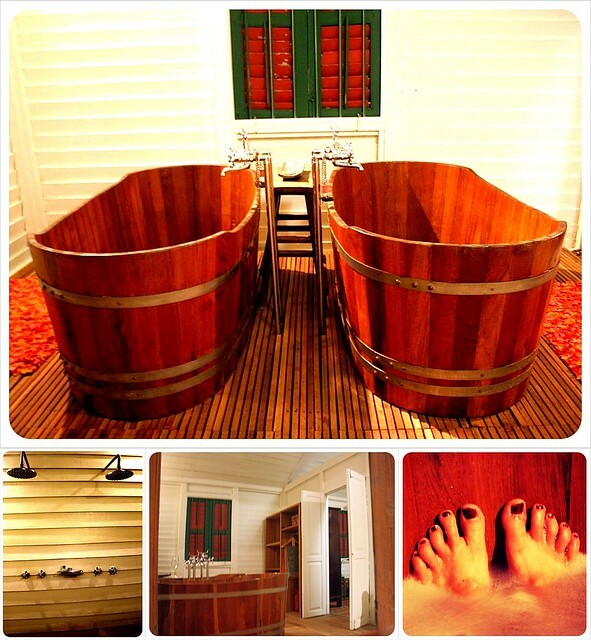 After a few weeks of heavy travel, we arrived here with an ever-growing list of things to get done – write posts, edit video, and then there’s that business I want to get to launching…Instead, we drink a delicious Chardonnay and take baths side by side in two wooden tubs in our bathroom. Next door, there are two showers in the wet room – complete with rain shower heads, organic exfoliating soap and a clay jar with shampoo (refilled daily). After the baths and the white fluffy towels, we climb into a device which, disguised as a bed, could also be some top secret experiment to create the deepest night’s sleep possible. We are enveloped by fluffy white pillows and several smaller colorful ones, and need only a crisp high thread count sheet to cover up in the humid Malaysian night. Sure, we could have held off and had the cake after lunch, but the entire experience felt so decadent that we devoured it on the worn-in red leather couch while we watched a DVD on our 42-inch flat screen TV. Cake and a film for breakfast? Paradise! Without even mentioning our work needing to be finished, we followed the beckoning of the long, luxurious lap pool when the film ended. Here we read, felt the breeze through the palm trees and the long reeds in the fields behind us. We are served ice water in large tumblers, slice of lemon and all. Eventually, we figure we’ve got to go explore the island, and so we manage to pack up and leave for the beach, a five minute cab ride away. We eat, we lay, we swim and frolic and couldn’t be happier to be in Langkawi. 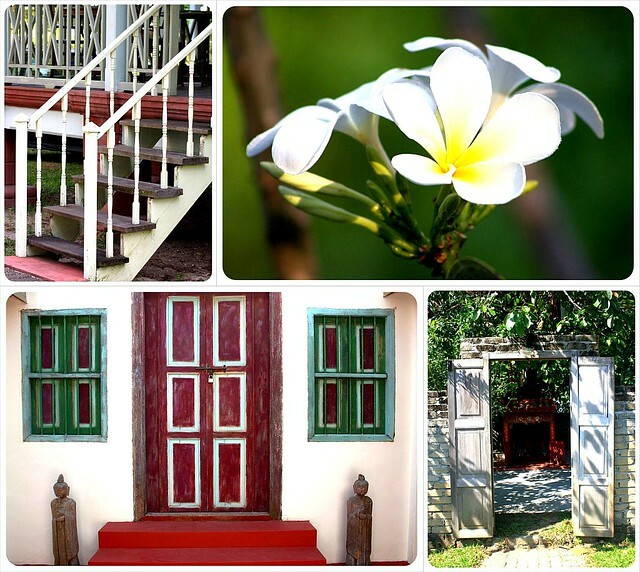 And yet the only place I wanted to be was back at home…at Temple Tree. Not everything is perfect, of course, but the problems are predicted and dealt with before we even have time to notice. Take for example my arch-nemesis – the mosquito. Because the buildings are very old, there are plenty of open spots for mosquitoes to get through – but we are bitten less here than anywhere else we have stayed in Malaysia, thanks to the mosquito zappers that the staff plugs in each evening at dusk when they come in and pull down your mosquito net and bring your breakfast for the next day. 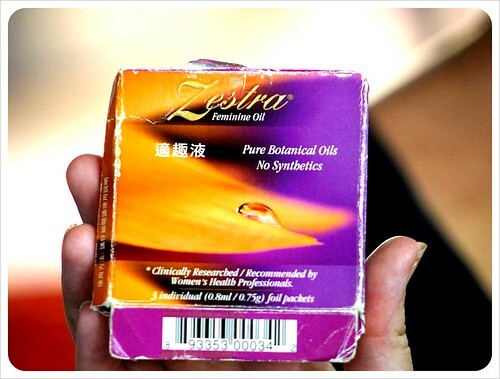 The room also comes equipped with all-natural bug spray, a local all-natural antihistamine, called Gamat, which reduces swelling and itching if we had been bit. 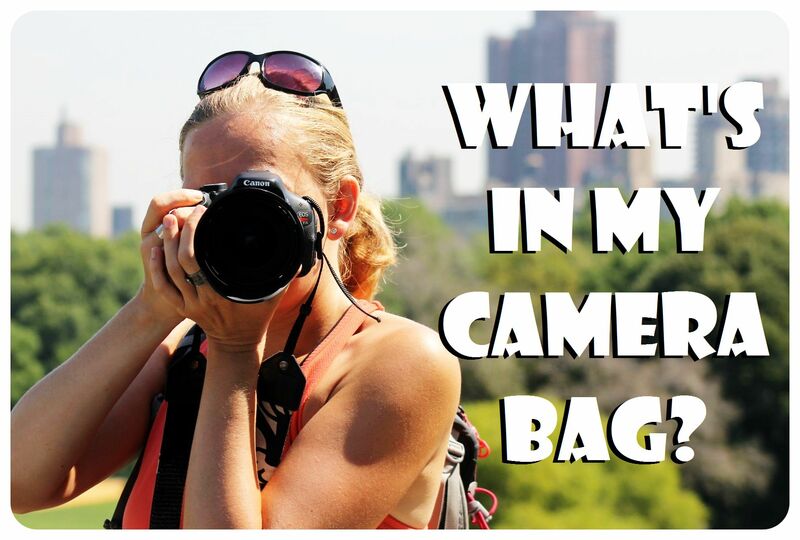 We also find flashlights, international adapters, and a pool buddy – a wooden box to carry sunscreen, water and books back and forth to the pool each day. Beautiful typically Asian sarongs hang in the closet and are free for us to use both at the pool and even to bring to the beach. We can purchase them at the end of the stay for only $8 each…a fair price, but we don’t as we both already have our own. The price of the sarong represents a wider aspect of Temple Tree that we love, and that is that the Value For Money factor here is fabulous. The room rate starts at just under $200 a night, but what would you pay to feel entirely carefree? Both Temple Tree and the neighboring Bon Ton resort (same owner, same general design concept) have top-quality restaurants with both Malaysian and the Mediterranean options. We opted for Mediterranean the night we ate Bon Ton, including goat cheese and eggplant bruschetta, four cheese pizza tapas, and a spinach, rocket, olive and Halloumi salad with chunks of fresh avocado and pistachios. As we watched the fire red sunset, we calculated the bill: under $30 for two at a luxury resort. Not bad… We were too full to sample the dessert plates, something we now regret when thinking about the chocolate plate, the cheese plate, or the more creative desserts like the ‘Ice Cream Sandwich Duo’ – a gingerbread sandwich with local Kaya ice-cream in the middle and a brownie sandwich with chocolate ice-cream and caramelized bananas. It should be noted that Temple Tree/Bon Ton is located 10 minutes from the airport, and take-offs and landings are a part of the stay here but there are so few that this is more of an interesting novelty than anything bothersome. Something had to break up the blissful solitude, like a little ‘pinch me’ to make us realize just how lucky we were to have been here…Some people have mentioned on Tripadvisor that Temple Tree should be more open about the number of cats that live on site. The owner, Narelle, is an animal lover, and has opened up a shelter on the island, LASSie. Some of the cats and a few dogs live here on site. The others are located at a nearby shelter. Although I am allergic to cats, between the breeze and the open windows, I had no problems and Dani (our resident cat-lover) was in heaven, of course. In fact, having our pet cat hop through the window made Temple Tree feel even more like home. We love the antique vase on the antique chest of drawers, that bed, the showers and did we mention the incredible lighting that makes just about any mood possible? There were so many stand-out features here, but the overriding feature is the feeling of having our own loft inside of a three-loft Oriental villa. For the money, you do not get a standard (however creatively designed) hotel room. 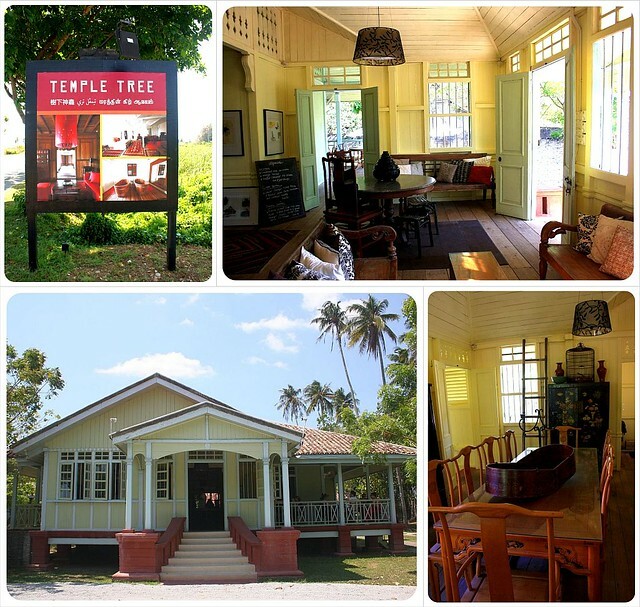 At Temple Tree you get to live inside of a colonial Malaysian villa and feel absolutely at home. The truth is, that while we loved the breakfast that first morning, it would have gotten boring to eat this every morning throughout a week’s vacation. 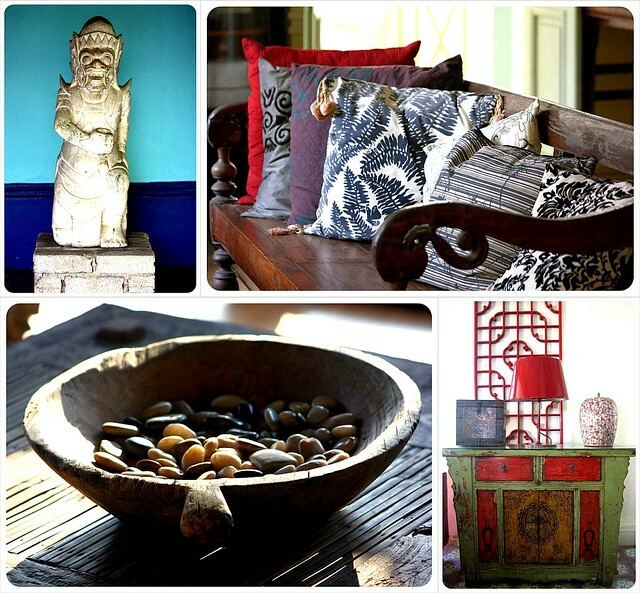 Guests might prefer a bit of choice or varied choices each day. An easy solution might be to offer a slip of paper with a limited menu (fruit, instant oatmeal, hard-boiled eggs, toast and/or yoghurt, plus fruit and that delicious cake) that guests fill out which is picked up in the evening during turn-down service. 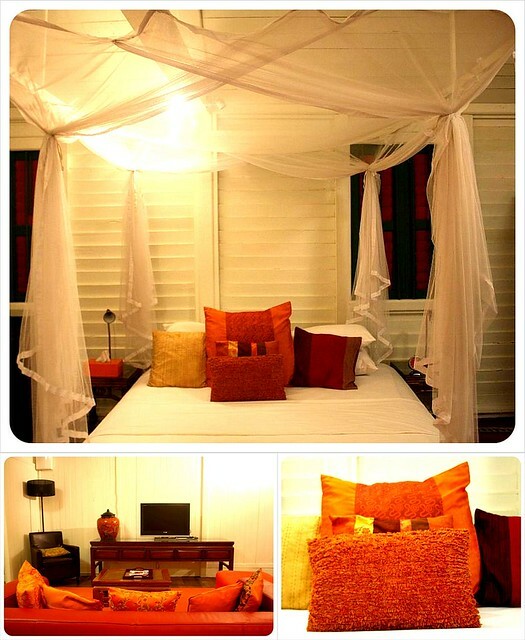 Temple Tree is easily the best option for a stay on Langkawi, and we would go so far as to call this resort a destination itself. You may come for the island feeling, but you will stay (or at least want to) for all the luxury minus the stuffiness. 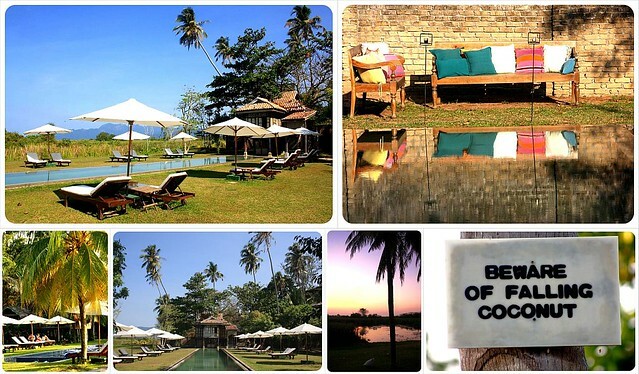 You can book your stay at Temple Tree via Booking.com. 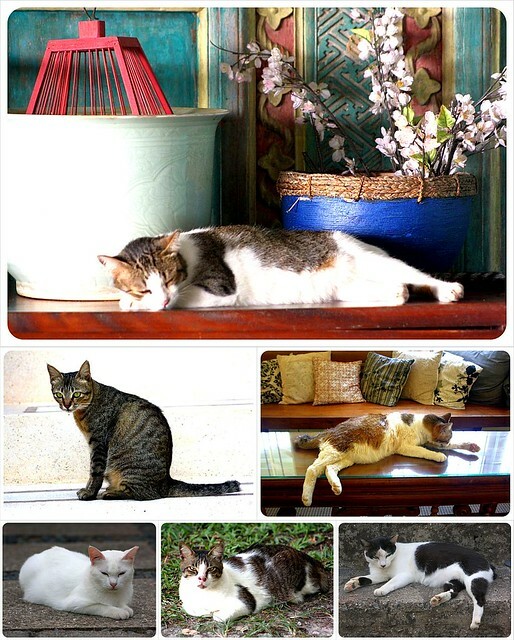 For more information about Bon Ton’s LASSie Animal Shelter, visit langkawilassie.org.my.